Whether you got to the top through hard work or luck, you need to find the right way to inspire people. If people feel like you aren’t leading them anywhere, then they won’t help you get anywhere. 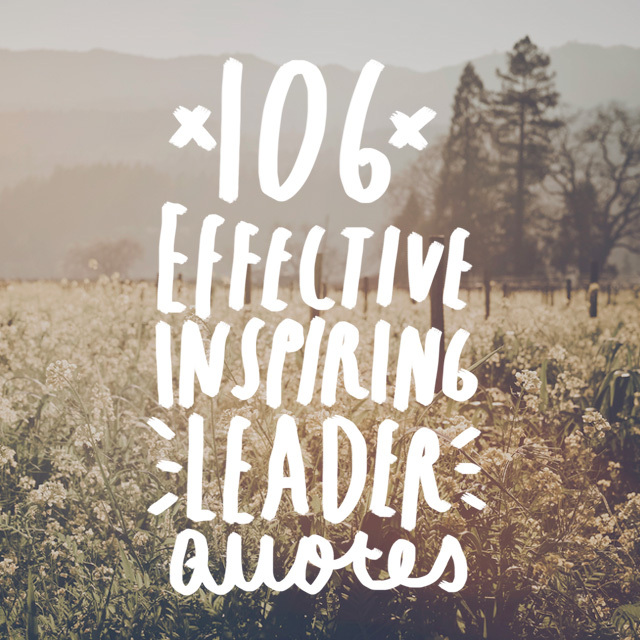 These leadership quotes will inspire you and give you the right words to say so that your followers can get behind you. 1. 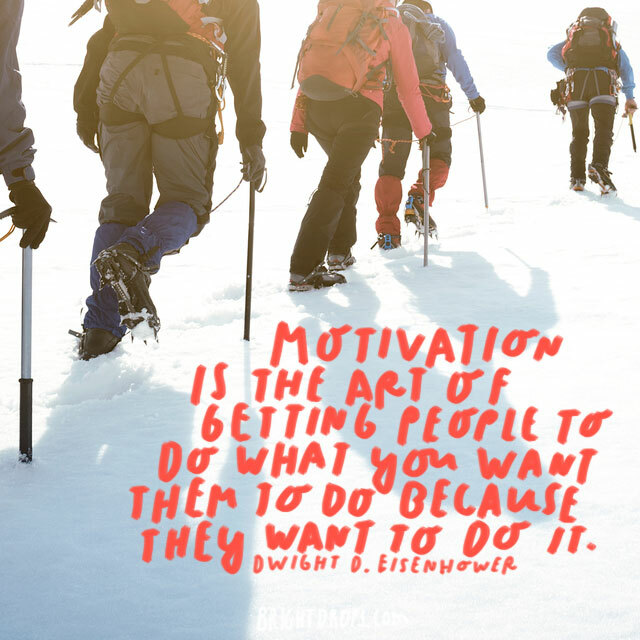 Ike Eisenhower on the Art of Motivation. True leadership is about getting results. If you are a great leader, people will want to please you. They will want to follow your lead. When you master the art of motivation, you will find that you do very little incentivizing and very little arm twisting. 2. 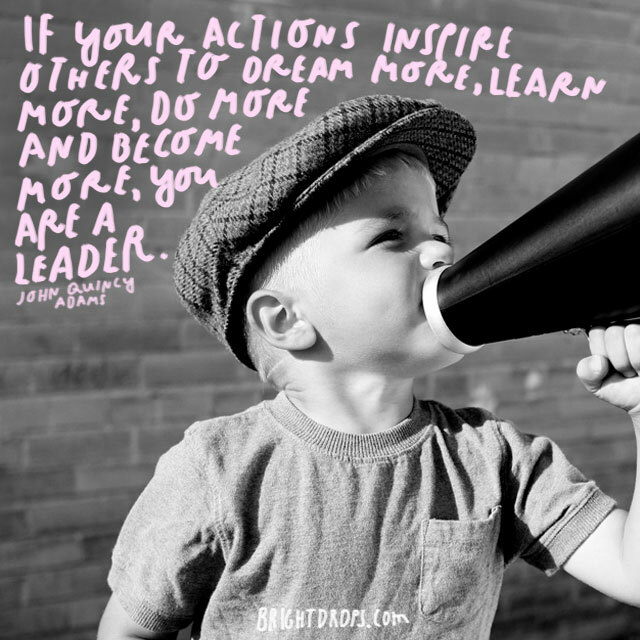 John Quincy Adams on Leading by Doing. You lead by doing. When others see that you are going the right way, they automatically want to follow you because they know you’re heading in the right direction. 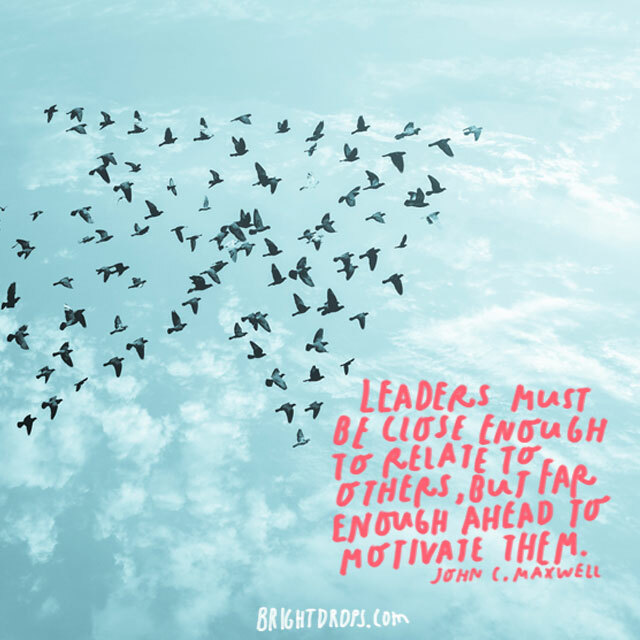 Think about the leaders you followed in your peer group or on your sports team. 3. John C. Maxwell on the Way. It’s not enough to tell people what to do. You must first know the direction you need to go. Even then, words aren’t powerful. You have to start leading the way. Others will follow your lead because they watch you blaze the trail. 4. 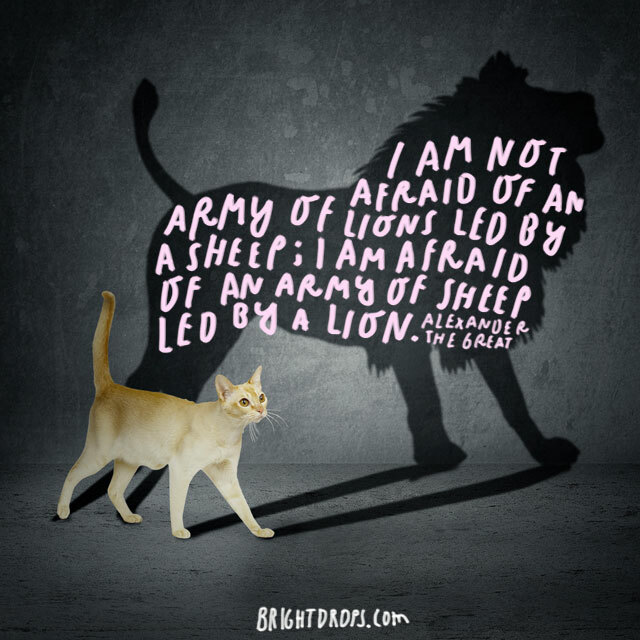 Alexander the Great on Sheep and Lions. If you are too timid as a leader, you will be devoured. Even if everyone around you is more experienced and more knowledgeable, you must lead with strength. Being a lion is about being strong, but it’s also about getting the lionesses to do your bidding. 5. 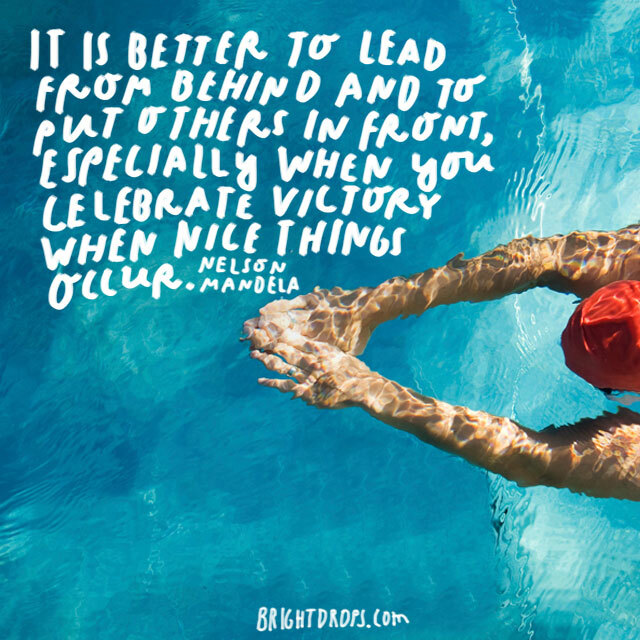 Mandela on Leading from Behind. 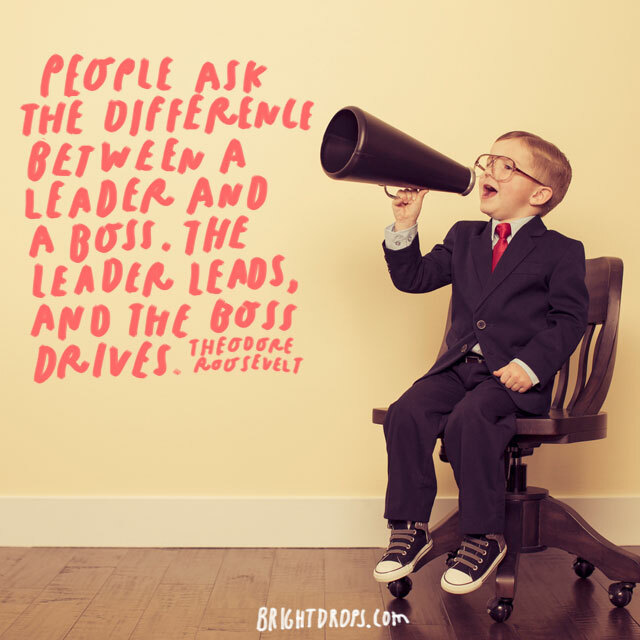 Many people talk about leading from the front. Nelson Mandela points out that you must put others first. 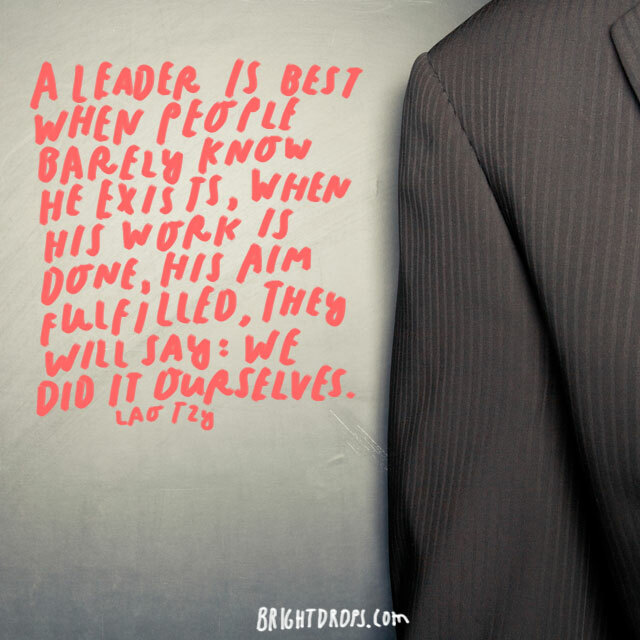 You always highlight what your subordinates are doing and how well they are doing it. That’s true leadership. 6. 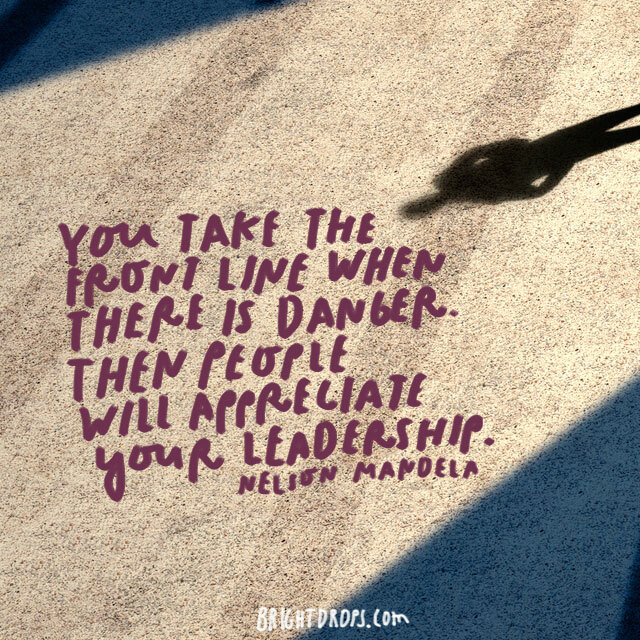 Mandela on When to Lead from the Front. Nelson Mandela does know that there are times you have to take the lead. When you are going into a bad situation, that’s when you put others in the passenger seat and take charge. The best thing you can do as a leader, is take all the heat and take none of the praise. 7. 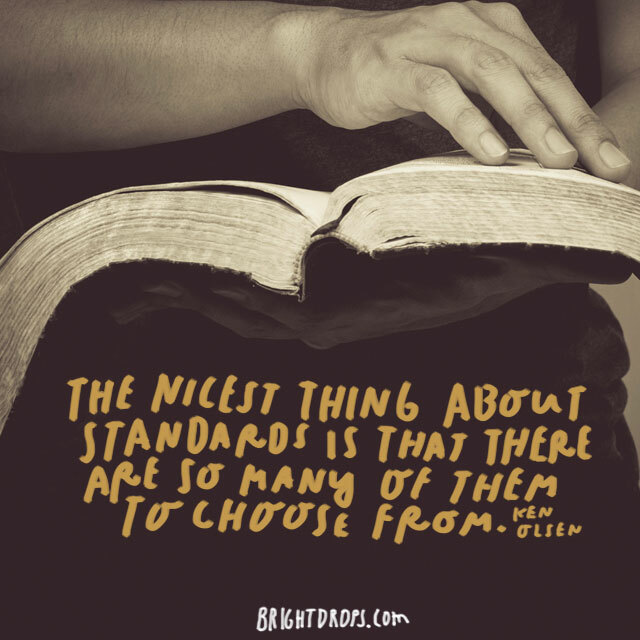 Ray Kroc on Standards. Ray Kroc built the McDonald’s empire on his standards. 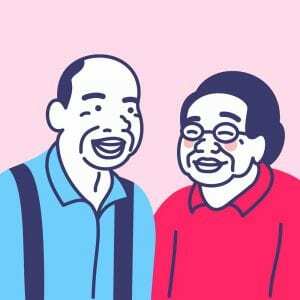 Whether he meant to or not, he built an entire multi-billion dollar industry in fast food. 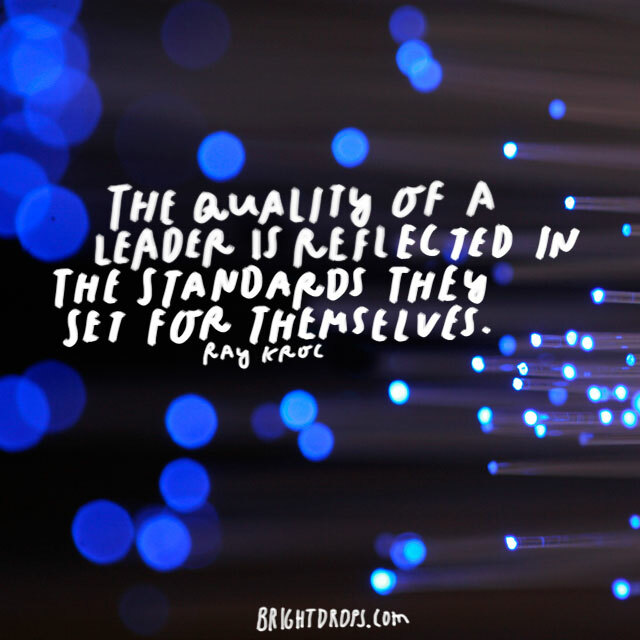 You pave the way for success or failure with the standards you set. 8. 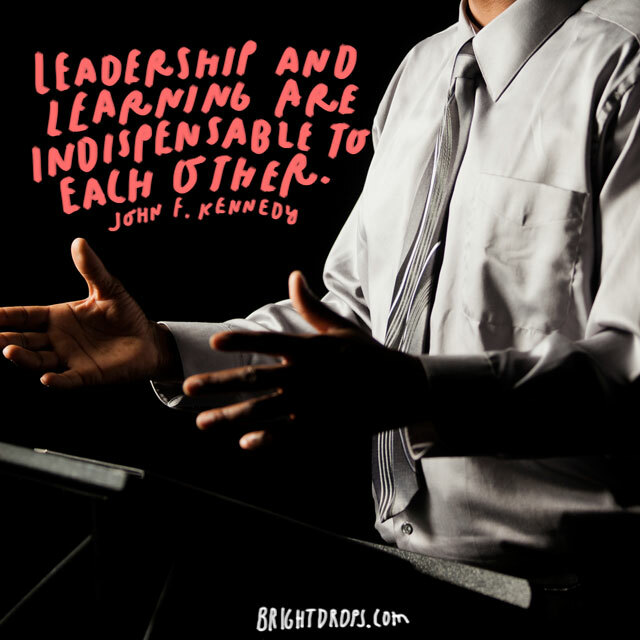 JFK on Learning to Lead. You must continue to learn. 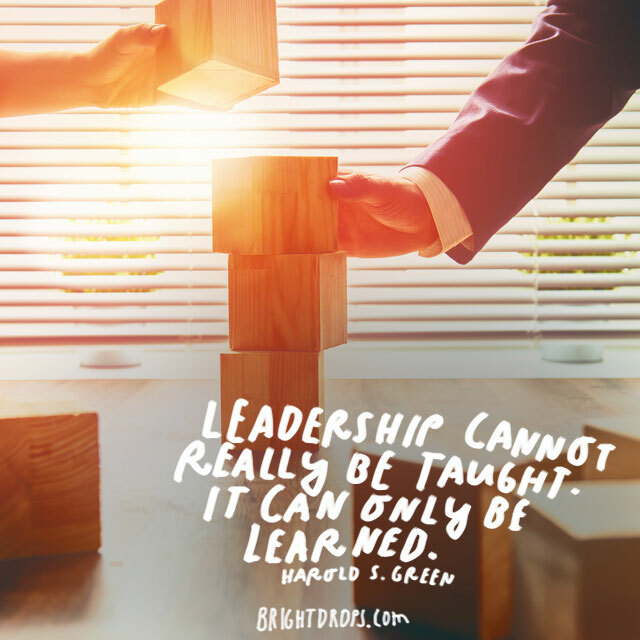 Never forget that you had to learn a lot before you were a leader. Your people will give you ideas. Don’t just accommodate them by hearing them. Listen and take into account those words. You might learn some new things. 9. Steve Jobs on Innovation. If you wait for someone to tell you how to lead or how to get things done, you’ll never be a leader. 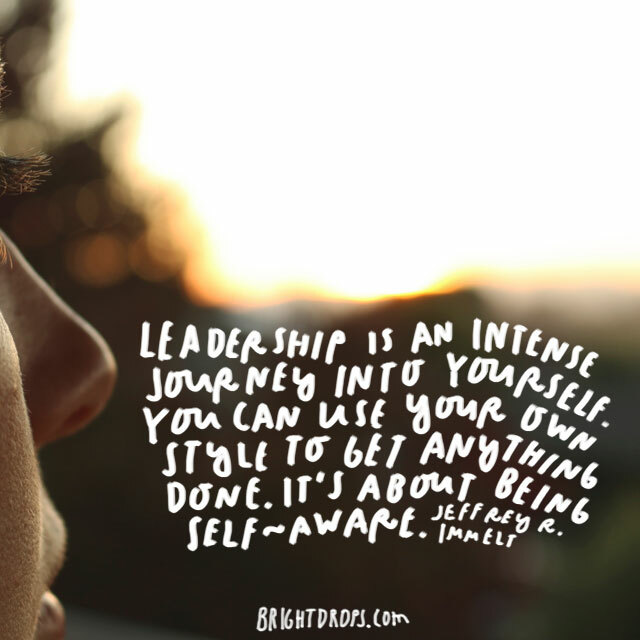 The best leaders are those who pave the way for themselves, and those following them. 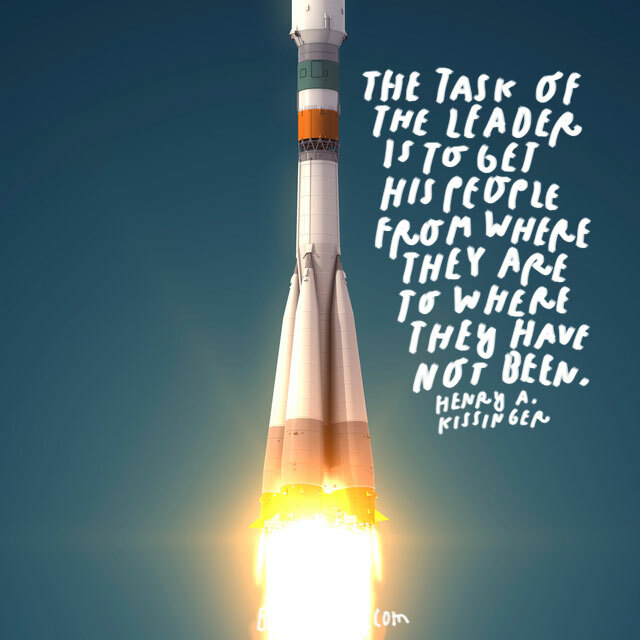 You have to take charge and show everyone where they’re going and how to get there. 10. Steve Jobs on Quality. If you expect excellence as your standard, people will rise to meet that expectation. Whether it’s in a classroom, on a sports field, or in the workplace, people will always rise to meet the expectation of their superior. If you set it low, you’ll get low results. 11. Lao Tzu on Being Invisible. When people get credit for their individual accomplishments, it makes you look good. Some leaders, the bad ones, demand that they take all the glory for every accomplishment great or small. It’s best if your people don’t even realize they need you. They’ll work harder if they think they are working for themselves. 12. 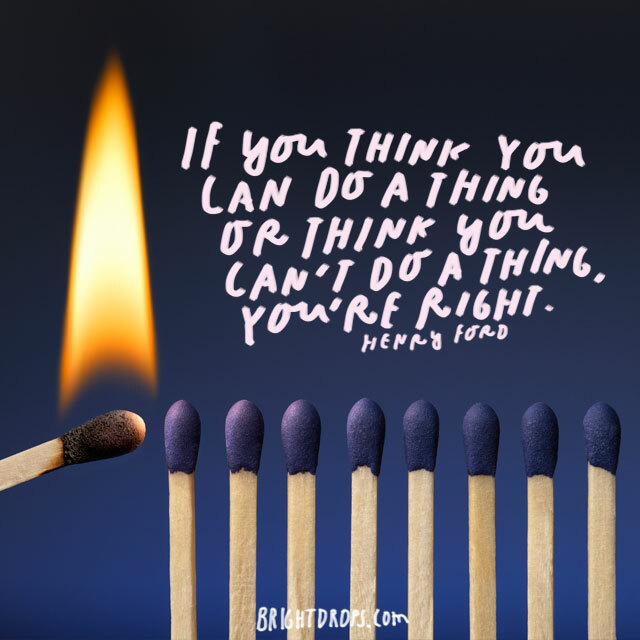 Henry Ford on Doing What You Think. This is a phrase you can use with your team. You can apply this to yourself and your team. Once you have something set in your mind, it’s done. So, if you are thinking negative, you’ll get a negative result. Make sure you have the right determination. 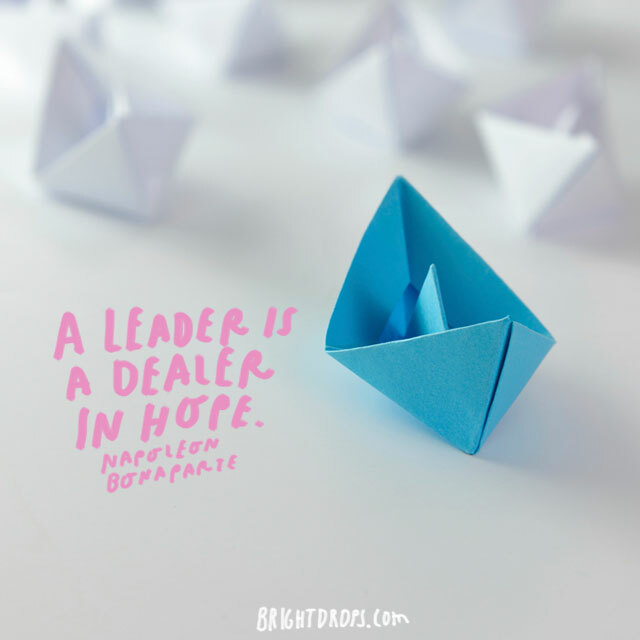 When you are dealing with your team, you must always instill a sense of hope. You should never let them know that the odds are insurmountable. We remember Napoleon as a tyrant, but he was a much loved leader for a very long time. 14. 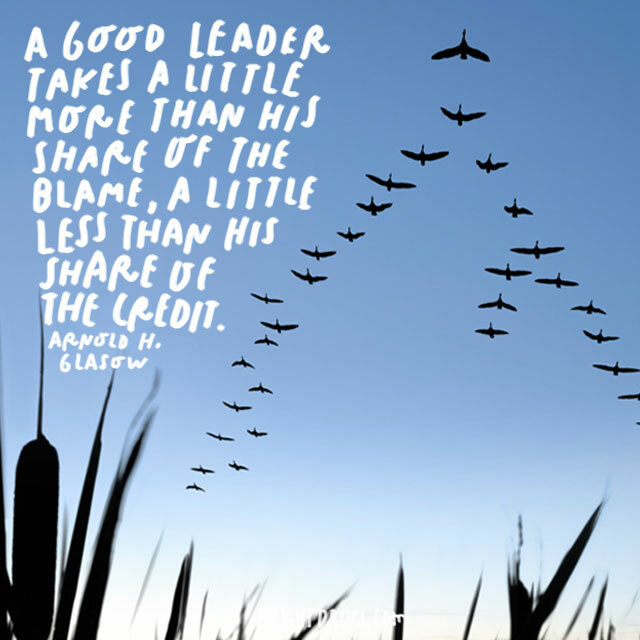 Arnold Glasow on a Good Leader. Similar to other leaders, Glasow keeps it straight and honest. 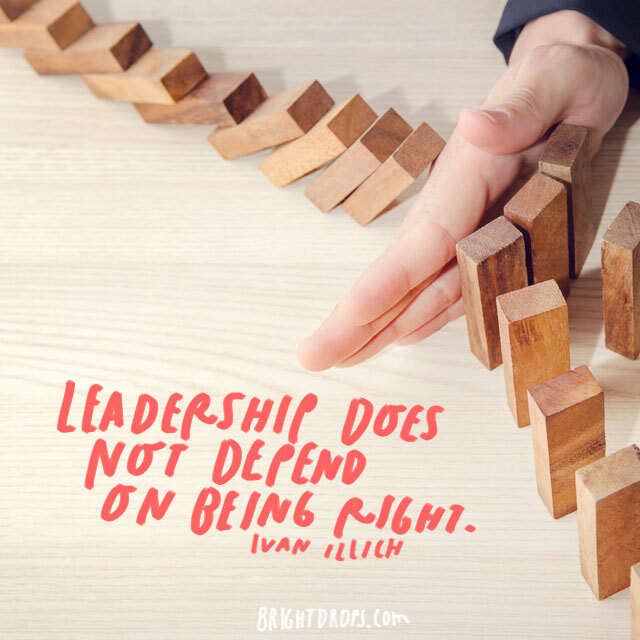 Leaders have to take the brunt of the failure. The good news is that when you take that hit, your team will have even more respect for you. 15. 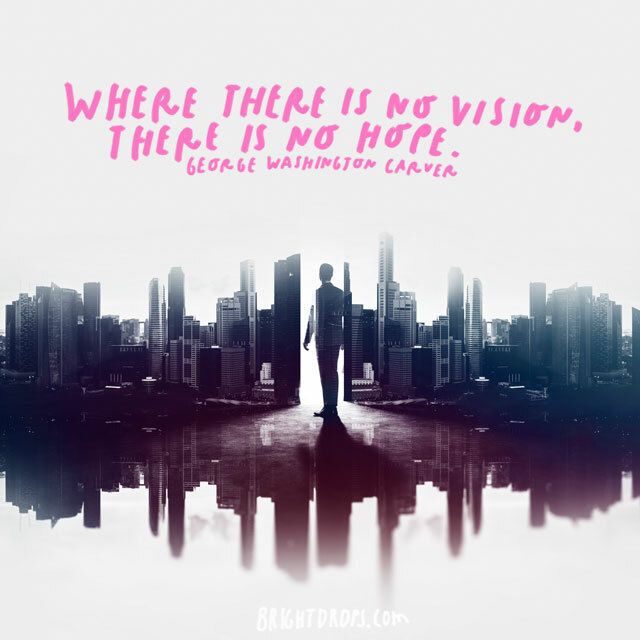 George Washington Carver on Vision. Here’s another phrase you can use with those you are leading. You can give your team this as part of their mantra. If they don’t keep the end in mind, they will lose focus. Always keep the end in mind so that you know where you’re going. 16. 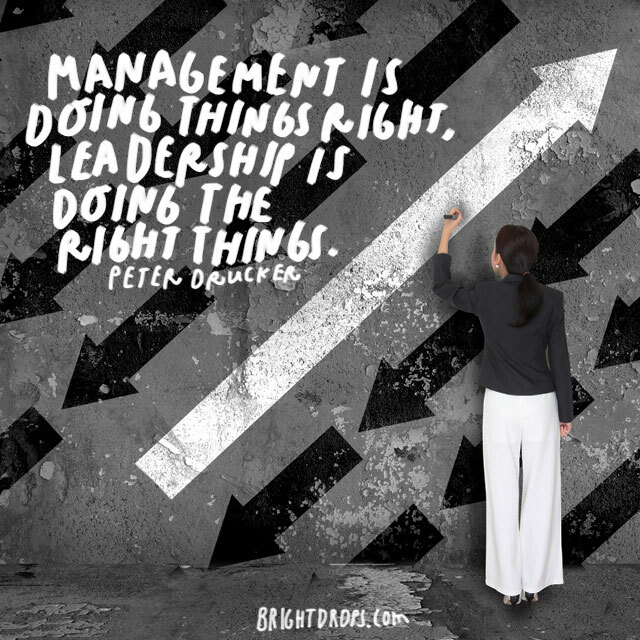 Management Versus Leadership According to Peter Drucker. It’s important to manage. However, don’t get confused and micromanage. You have to trust your team to do things right. You must focus your efforts on doing the right things. In all situations, you must focus on the big picture. 17. Management Versus Leadership According to Tom Peters. 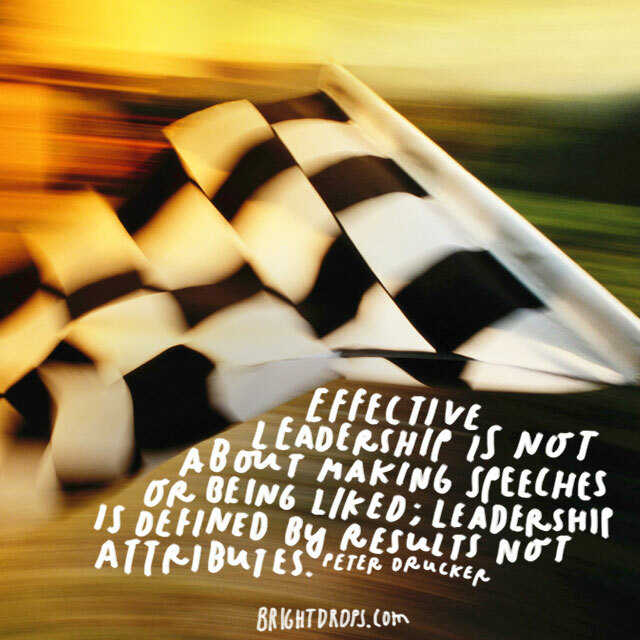 Tom Peters emphasizes the same thing that we hear echoed in many of these leadership quotes. You must always lead, not manage. 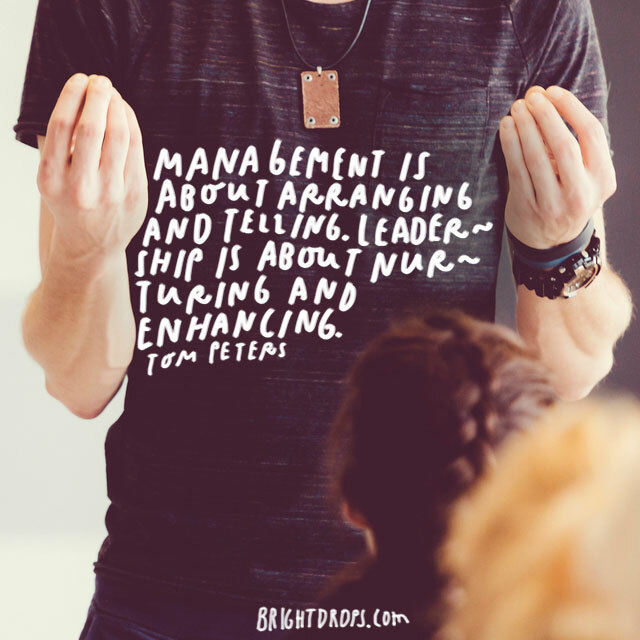 Management is usually something that is natural. 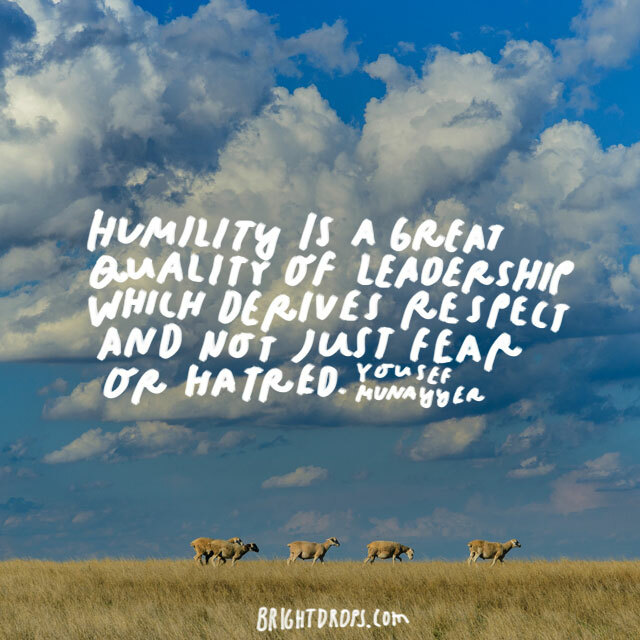 You need to be sure that you focus your efforts on those traits of leaders. 18. 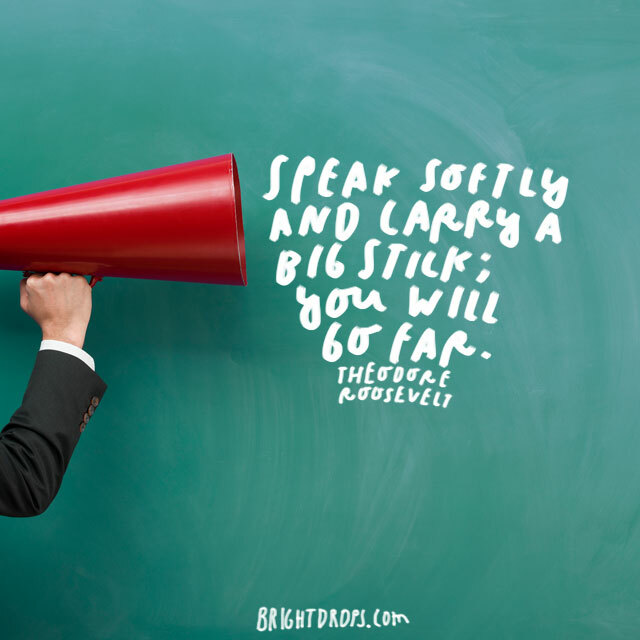 Teddy Roosevelt on Big Sticks. Choose your words wisely. 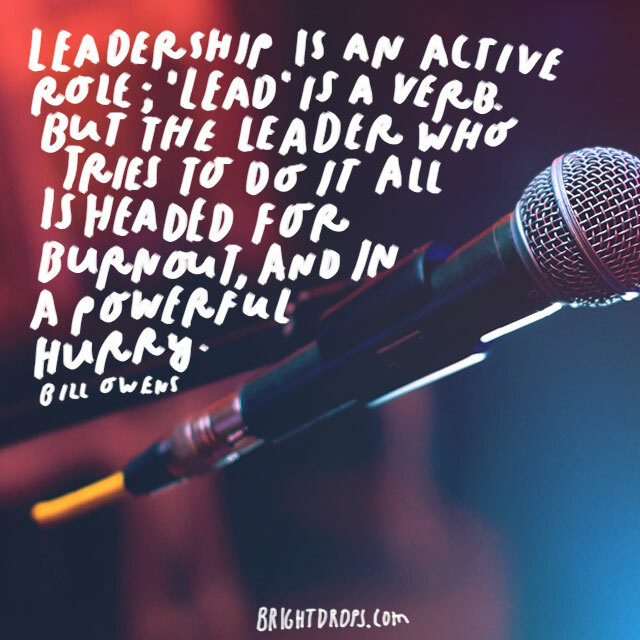 You don’t have to talk constantly to lead. How many times have you heard the manager yelling at a restaurant only to slow the process down? Instead, say as little as possible. The big stick is being firm when you must be. 19. 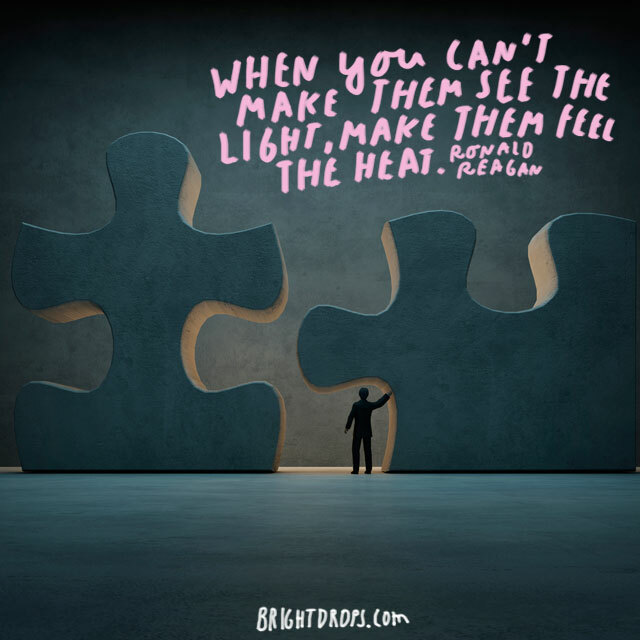 Ronald Reagan on Seeing the Light. From time to time, you do have to manage. At that point, you have to make sure your people know you’re their boss, not their friend. It’s great to fill them with visions of sugar plums, but they have to know that there are consequences for under performing. 20. 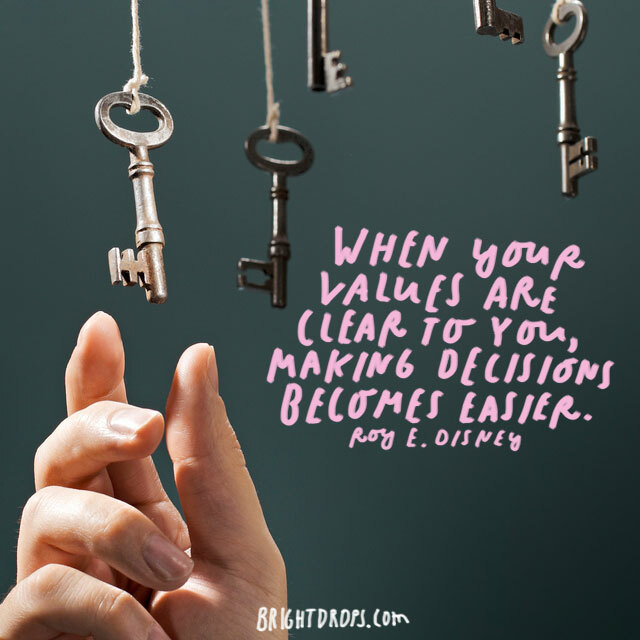 Roy Disney on Clear Values. 21. 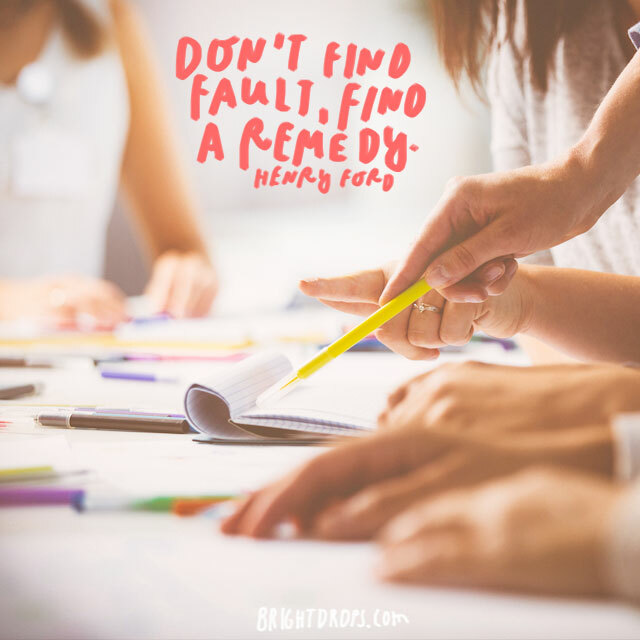 Henry Ford on Finding Remedies. This is a great refrain to team members that are struggling to get on board. This is the type of leadership quote that can be written in board rooms from now to eternity. When someone is so focused on flaws, they forget that they need to fix them. 22. Teddy Roosevelt on Leading. The literal definition of leader is one who leads. You must take charge of the team and lead them on the journey. If you just drive them to wear they need to be, you are managing them or bossing them around, but you aren’t really leading. 23. 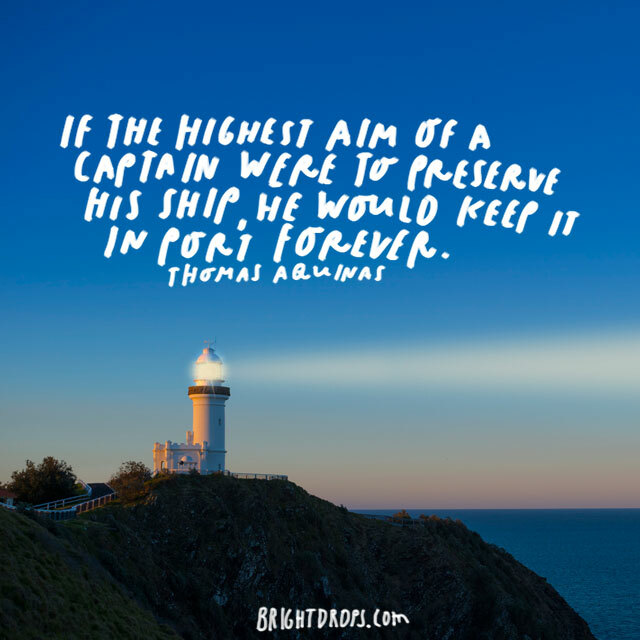 Thomas Aquinas on Preserving the Ship. As a leader, you have to take risks. The very idea of taking having the ship, is to take it out to sea. If you only do what’s best for the team or the company, you’ll never go out there and do anything. You’ll sit and wait for things to happen for you. 24. 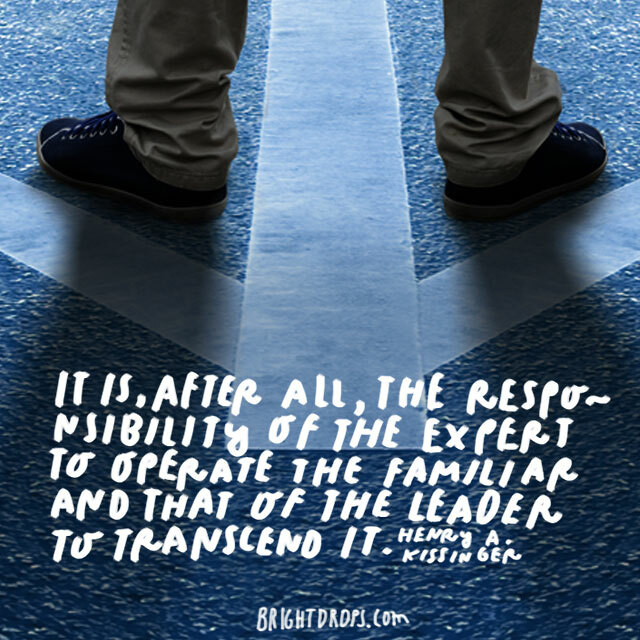 Henry Kissinger on the Task of a Leader. 25. 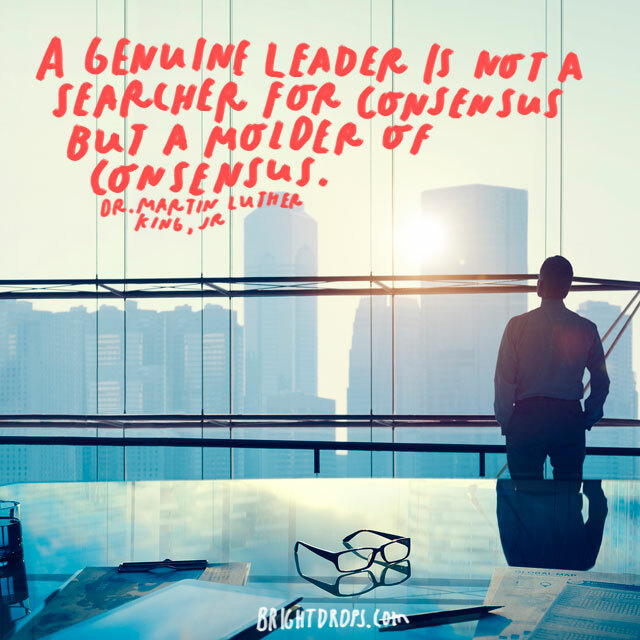 MLK on the Consensus. When you are in the role of leadership, you must consider the desires of those you are leading, but you must not solely rely on them for shaping where to go. You must mold the will of those behind you that you are the one with the answers. 26. 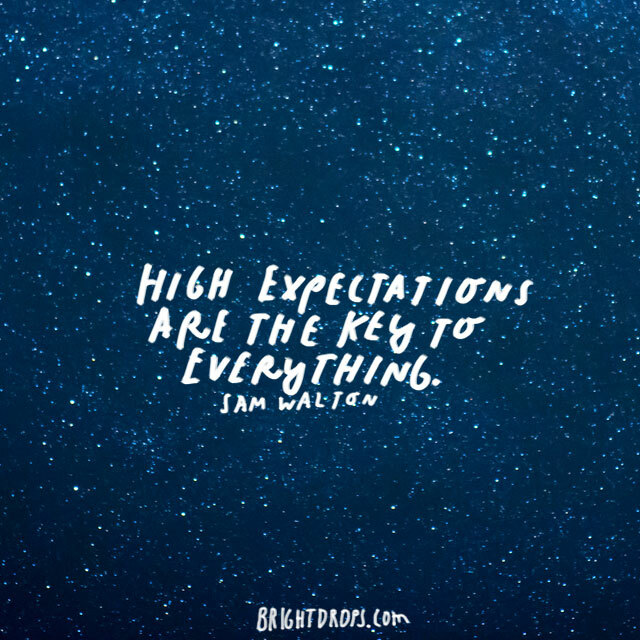 Sam Walton on High Expectations. When you have high expectations, people rise to meet them. If you allow people to only give a partial effort, you’ll only get partial results. Walmart became the giant they are today because of Sam Walton’s great leadership. 27. 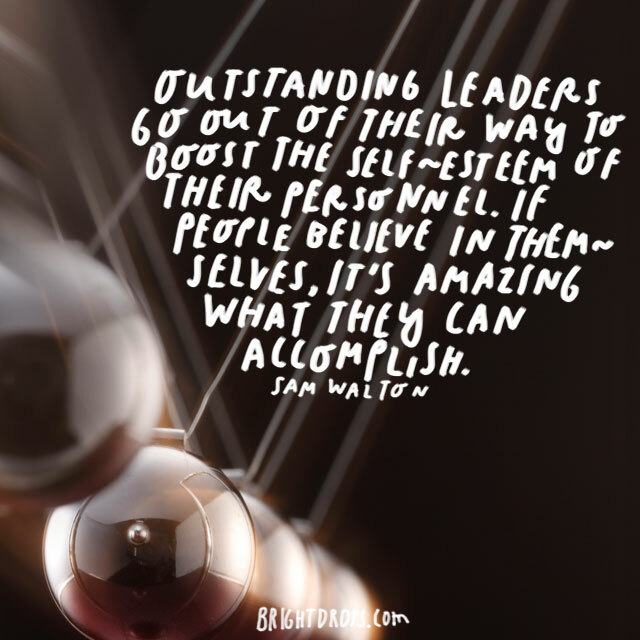 Sam Walton on Outstanding Leaders. The truth is that you must have internal motivation and high self worth to succeed at anything. Since Sam’s demise, the mega retailer’s reputation has taken a hit. Even now, you’ll never hear anyone who worked for him say a negative word about him. 28. J. P. Morgan on Going Far. When you think you’ve reached your highest point, you will be able to see that next accomplishment. The funny thing is that it seems close. Every achievement paves the way for another big goal to be met. 29. Albert Schweitzer is the Example. 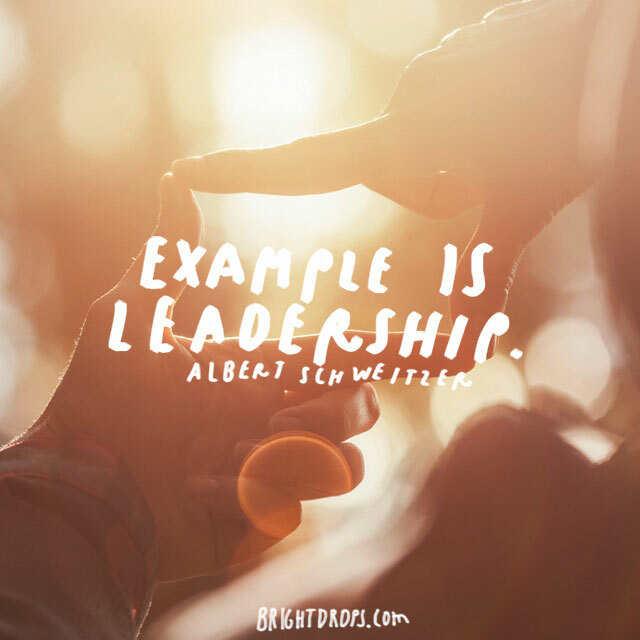 When you lead, you are setting the example. Among leadership quotes, this one is the master of brevity. Despite being only 3 words, Schweitzer makes a bigger statement than many on this list. You must be the perfect teammate. 30. W. on Duty, Honor, and Country. George W. Bush was one of the most divisive people to have the highest office in the land. However, he was a strong leader. Whether you’re on the right or the left, you can appreciate his commitment to leading in the right way. 31. 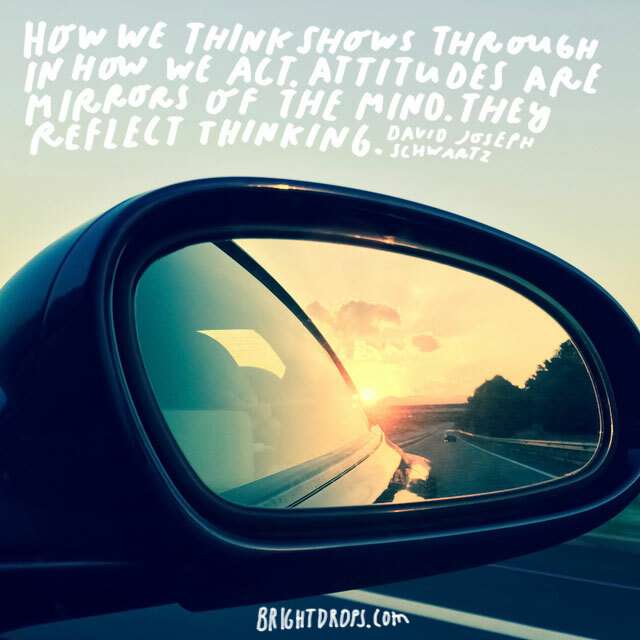 David Schwartz on Thoughts and Actions. Remember that your actions are only a reflection of what you think. When your team sees the way you behave, they know the way you act. This applies to your approach to the work and your approach to the individuals. 32. Tony Blair Says No. No one wants to be called a Yes Man. 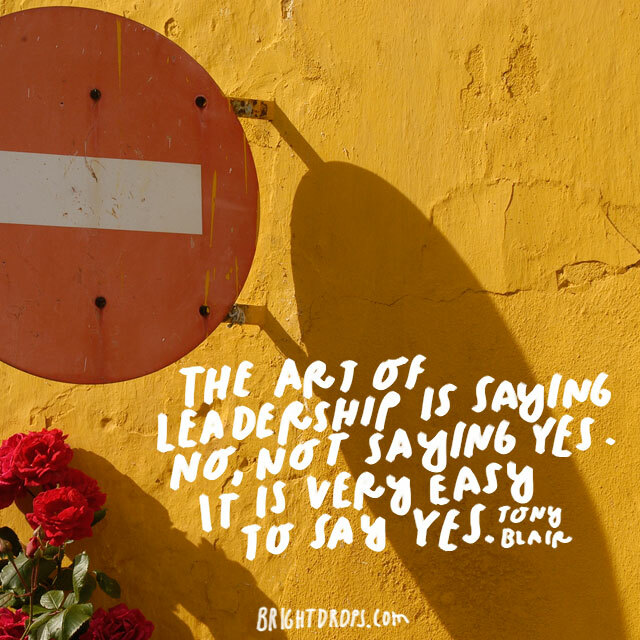 You must be sure that when your team is petitioning for your attention, resources, or anything, you should start with the mindset that you are going to say no. Make them earn the yes. When they do earn it, say it with glee. 33. Gandhi Gets Along with People. Gandhi was the originator of peaceful protests. Before he thought of this better way, people led rebellions with force. 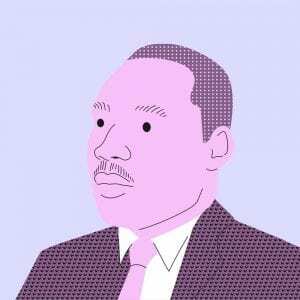 Instead, he found a new way to change the world. You have to balance being strong with getting along with people. You can’t always say no. 34. Peter Drucker on Results. Every single one of these leadership quotes mentions this concept in some shape or form. You cannot be a leader for the credit or celebrity. You must lead a team in the direction they need to go in order to achieve goals. 35. 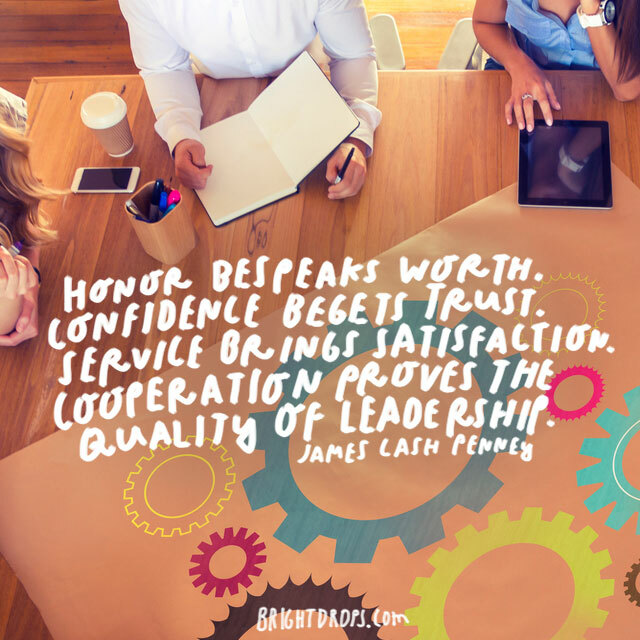 James Cash Penney on Cooperation. In order to be a great leader, you need to have honor, confidence, and service. 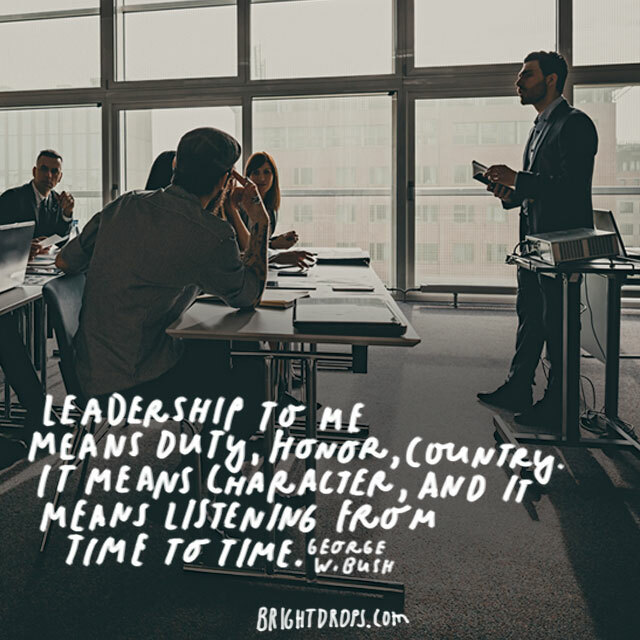 However, the most important aspect of a quality leader is their ability to work with others and get others to work together, especially those who struggle to be part of a team. 36. 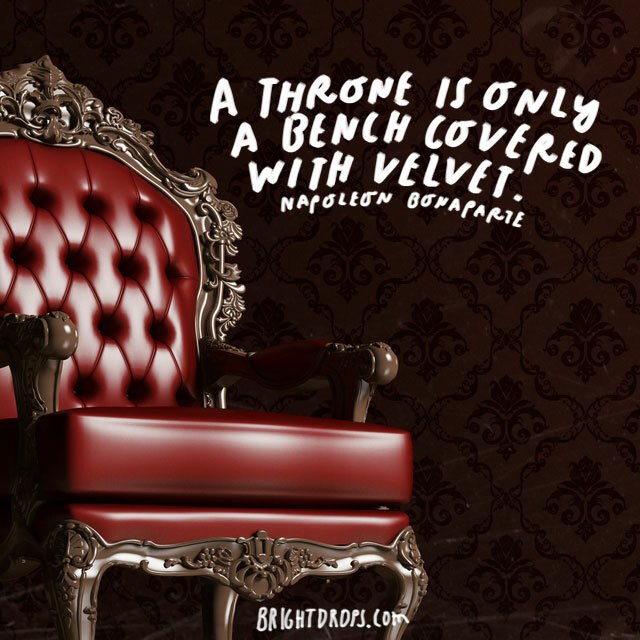 Napoleon on the Throne. Napoleon got rid of royalty. 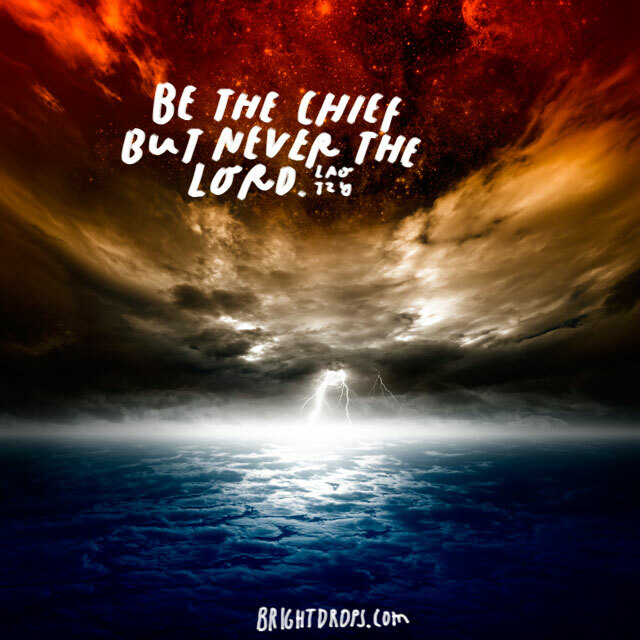 He never had a desire to be praised and upheld as a high and holy ruler of a nation. Instead, he stood for strength. You can’t lead people if your purpose is to ascend the ranks. 37. 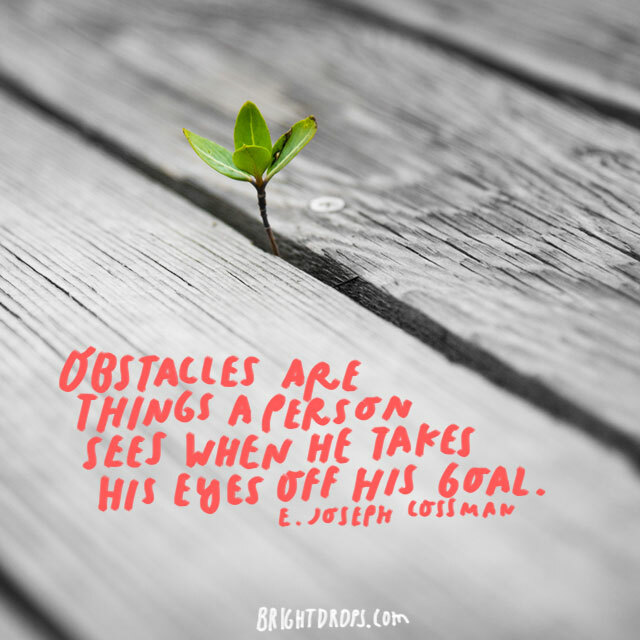 E. Joseph Cossman on Obstacles. This should become part of your internal drive that helps you achieve every goal, personally and professionally. You must be like a horse with blinders. Do not get distracted, but always keep your eye on the prize you are chasing. 38. 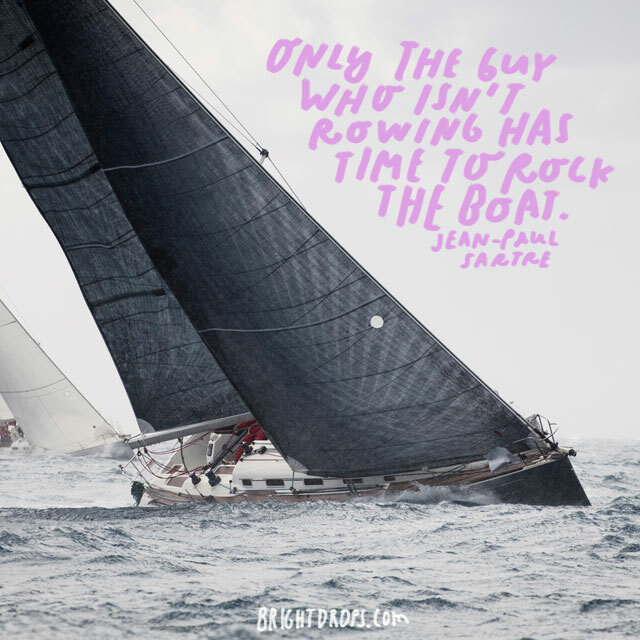 Sartre on Rocking the Boat. This is something you can use with your team when they are discouraged. If they face criticism from the higher-ups or from another lateral group, be sure to point out that most of these criticisms are probably leveled at them by those who aren’t doing their fair share. 39. John C. Maxwell on Relating and Motivating. You have to walk that tightrope between equal and superior. 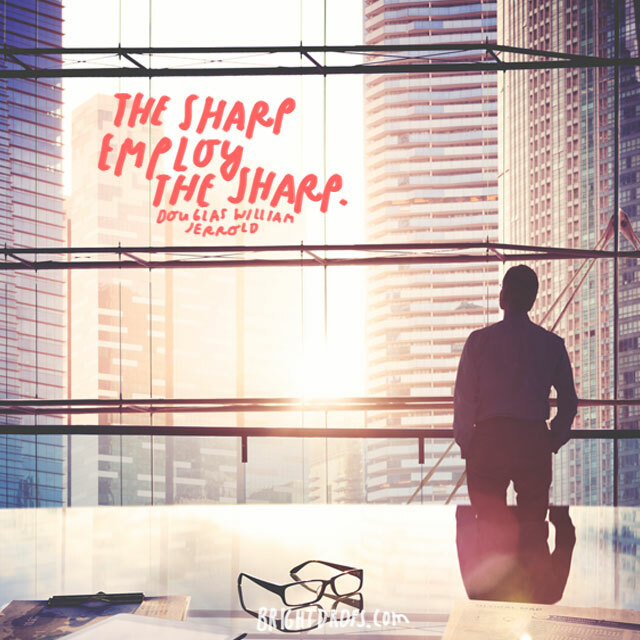 You must be always encouraging and motivating your staff, but you must manage to seem like you’re on their level. It’s a difficult balance to master, but when you do, you will have mastered leadership. 40. 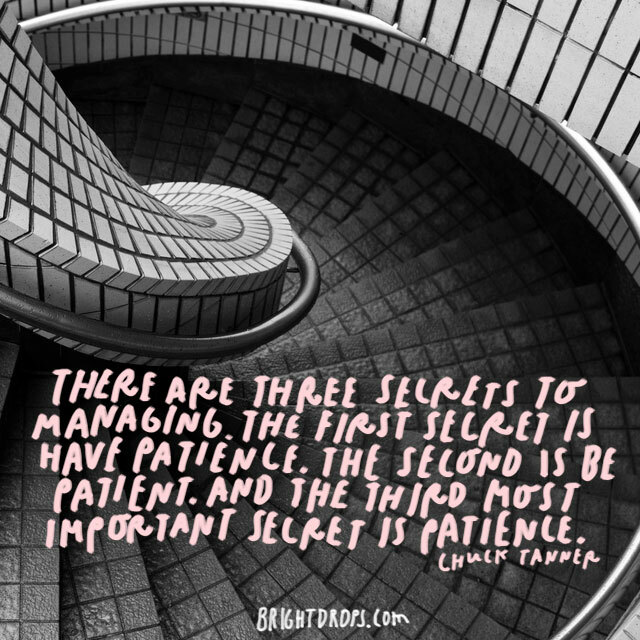 Chuck Tanner Has 3 Secrets. You have to be patient. Your team won’t respect you instantly. They won’t reach their goals overnight. You won’t earn the credit you deserve or the next rung of the ladder as soon as you should. When you continue to manage the right way, you will have all those things. 41. 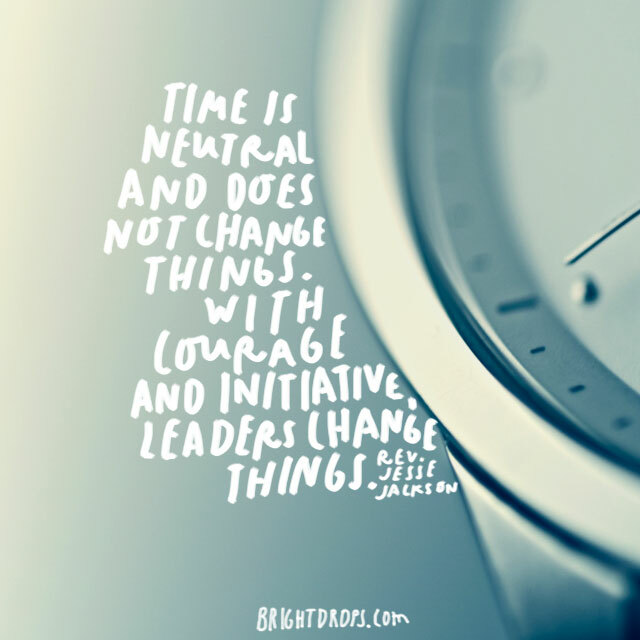 Jesse Jackson on Time. You can’t hope that things will get better as time goes on. You must take charge of every situation and lead the way to success. 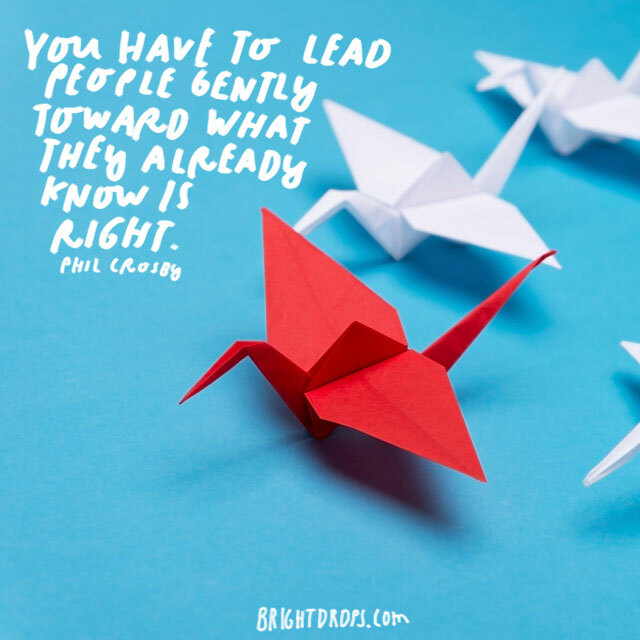 Especially as a new leader, you must show the initiative that you want your team members to show in their efforts. 42. Kissinger on Earning the Name. Sometimes, you have to take a stand. Especially when you are leading the way. You will come to a place where you find yourself making the right decision but everyone will question you. 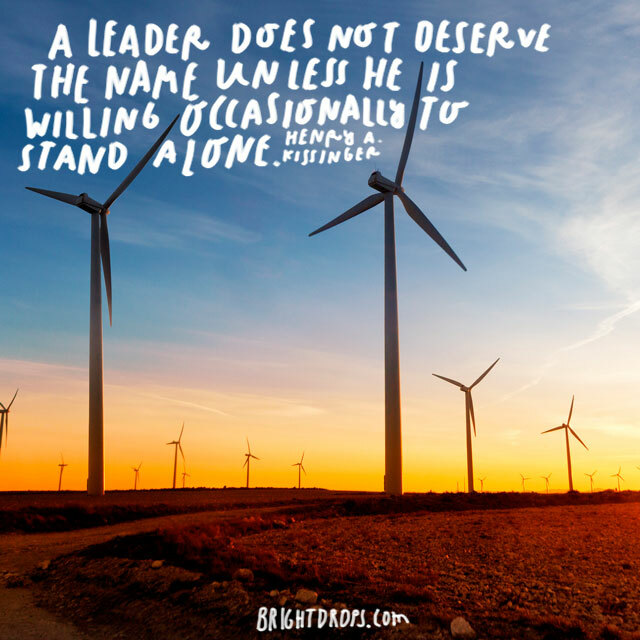 Stand firm; it will make your leadership more respected. 43. Casey Stengel on Keeping them Separated. As far as leadership quotes go, this one is meant to be humorous. However, every bit of humor has some honesty mixed in it somewhere. Don’t let the less trustworthy members of your team undermine those who are filled with fervor. 44. 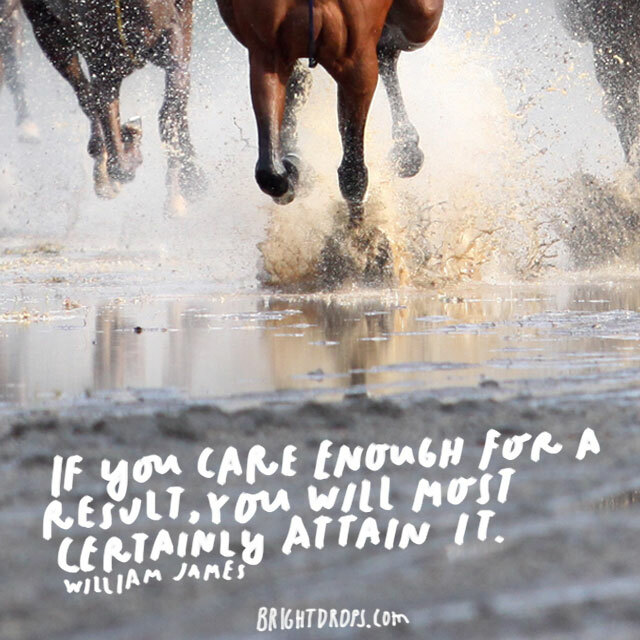 William James on Getting Results. If you want anything bad enough, you’ll get it. This is the mentality you must have as a leader and you should instill that same drive and desire in those you lead. If they see your passion, they will emulate it. 45. 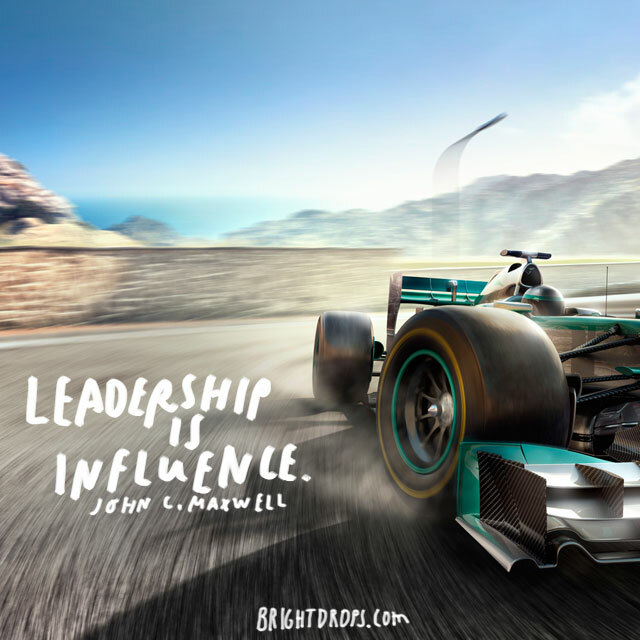 John C. Maxwell on Influence. Being a true leader is putting your passion into what you do. In doing that, you will influence those around you to follow that lead. Before you know it, you have a team following your lead and they are all working toward the same goals. 46. 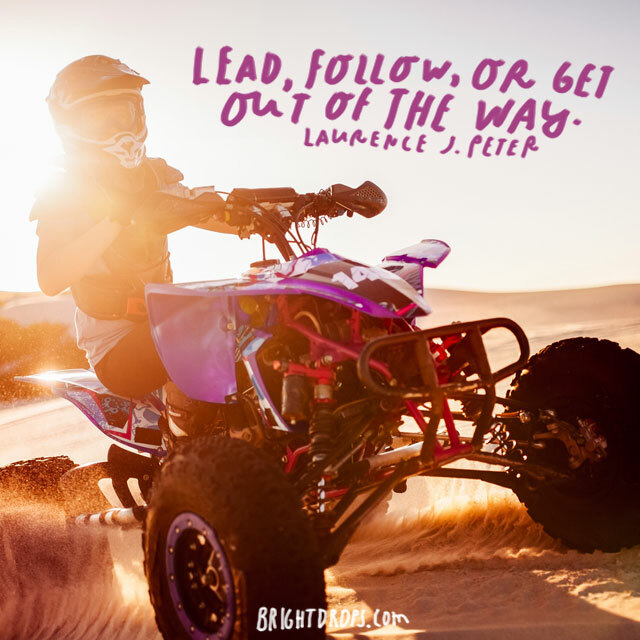 Laurence J. Peter Gives You a Choice. The simple fact is that you will have difficulty taking a stand. You will have some resistance when you start to passionately pursue your goals. At that point, you have to decide if you will continue, or find something else to do. 47. 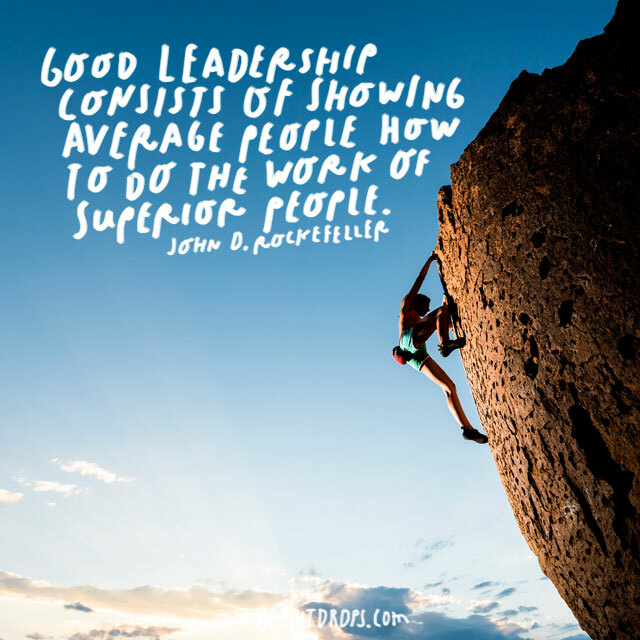 Rockefeller on Good Leadership. Everyone has average ability. A true leader can take those average people and inspire them to give more than they have. Even more than that, a true leader can mold those average people into something more than they are. 48. Chester Nimitz on Picking Good Men. You don’t always get to choose the people you have to work with. If you can, make sure you pick the best ones in terms of character. You can always teach the talent and skill you need, but you can never teach the right attitude and ambition. 49. 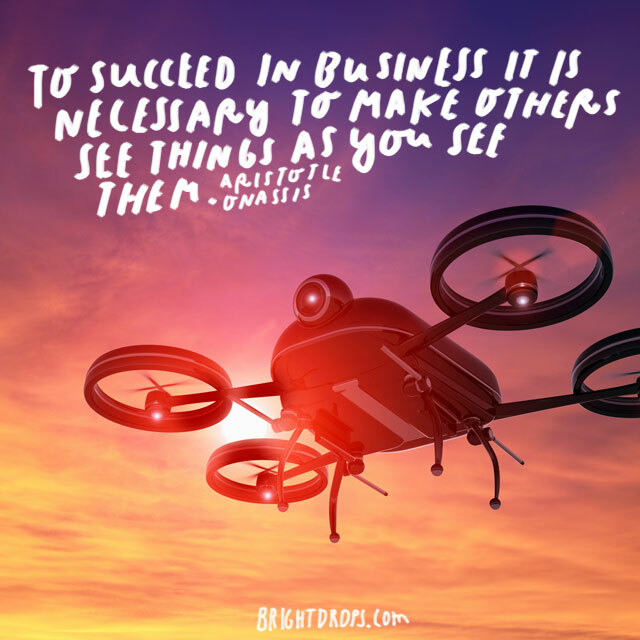 Aristotle Onassis on Succeeding in Business. You have the right mentality and the right people. Now, you have to make sure that they can see the same success that you see. You must have one set of goals. If you are on the same page, each person will make the right decisions. 50. 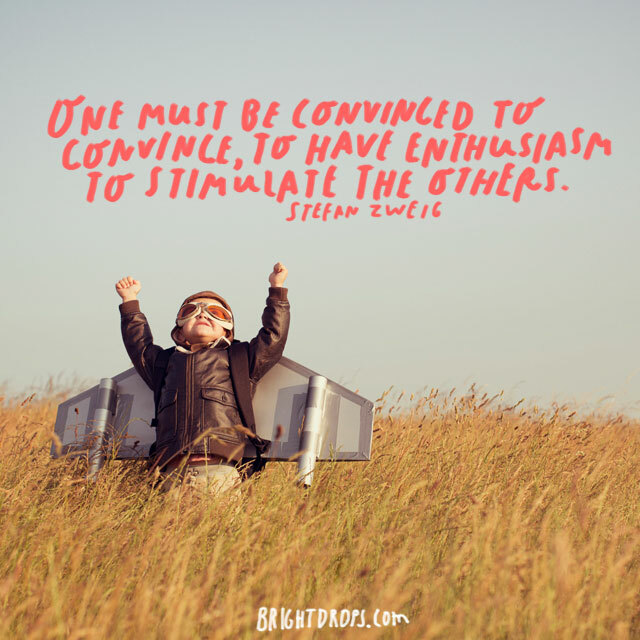 Stefan Zweig on Enthusiasm. Before you can truly have inspire people, choose the right ones, or make them see what you see, you must first look within. What is driving you? What are your goals and ambitions? Find out and find it. 51. 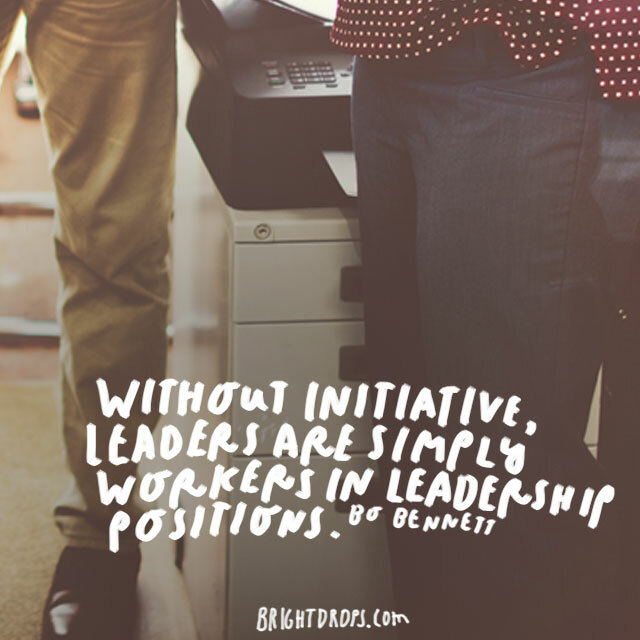 Bo Bennett on Initiative. If you don’t have that internal drive to push yourself, you can never push a team to pursue those goals. The best way to lead people is to inspire them to become leaders themselves. If you can instill that same passion in them, you are a great leader. 52. Phil Crosby Pushes People, but Gently. People already know what they are supposed to be doing. You have to give them the inspiration to go ahead and do what they are already expected. It seems like a no-brainer, but leading people is not simple at all. 53. 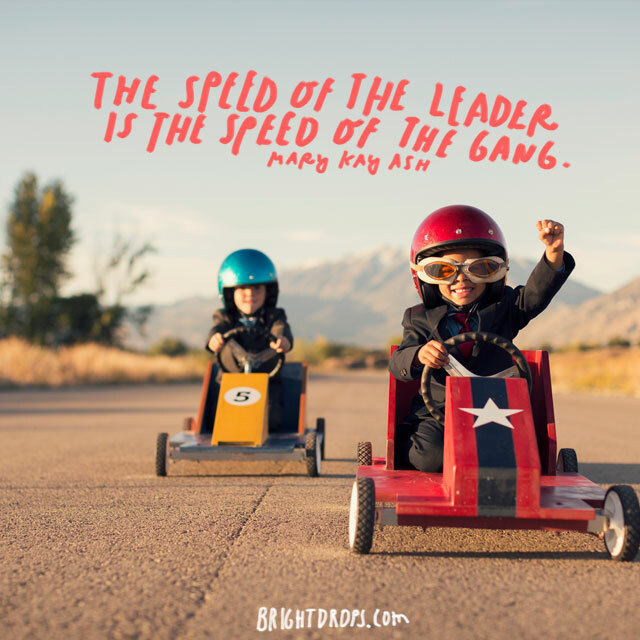 Mary Kay Ash Has a Need for Speed. You hear people say the phrase “the art of leadership” almost all the time. The real art of leadership is getting people to have that same passion and to work at the same pace. If you have a team working like that, you are a master. 54. 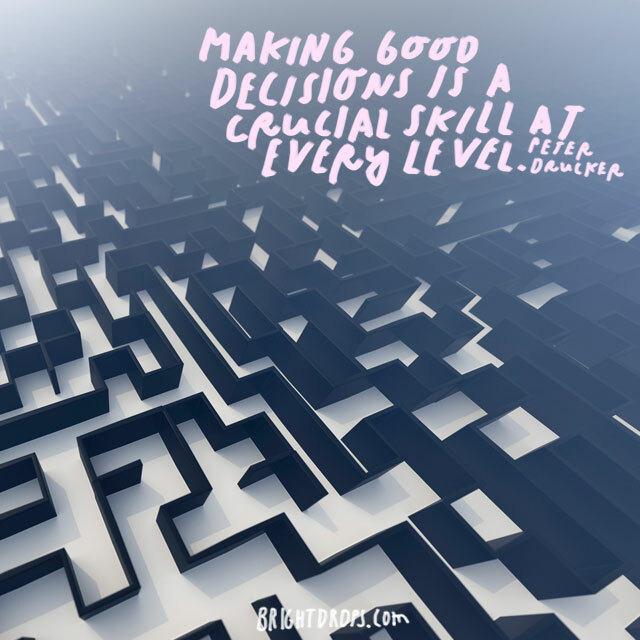 Peter Drucker on Good Decisions. 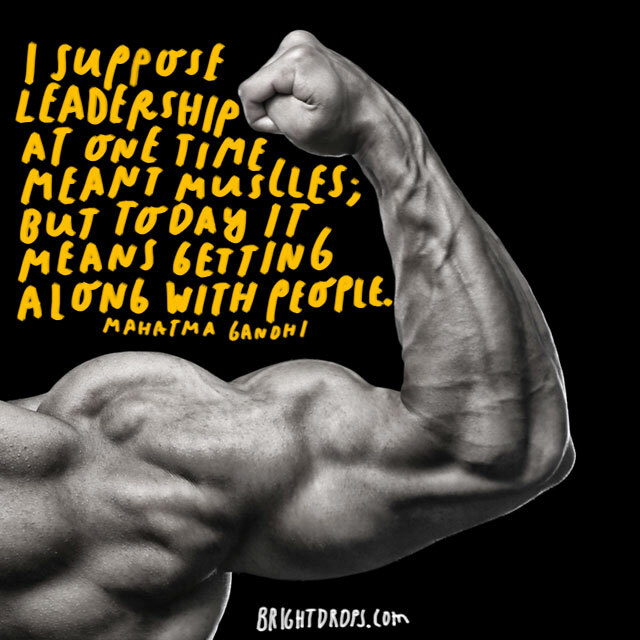 Whether you are the leader or not, this is a leadership quote that really hits home. You have to make the right decisions in every level of the organization; that’s the only way to ensure success. 55. 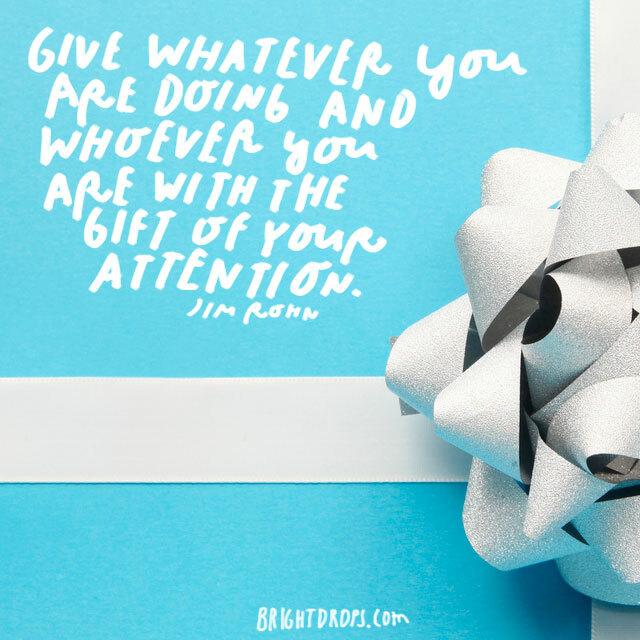 Jim Rohn on Paying Attention. When you are in the leadership role, there is nothing more important than giving 100%. You have to work with your fullest attention obviously. You also have to give your team your entire attention. You have to know every detail of their work and their mentality at every moment. 56. 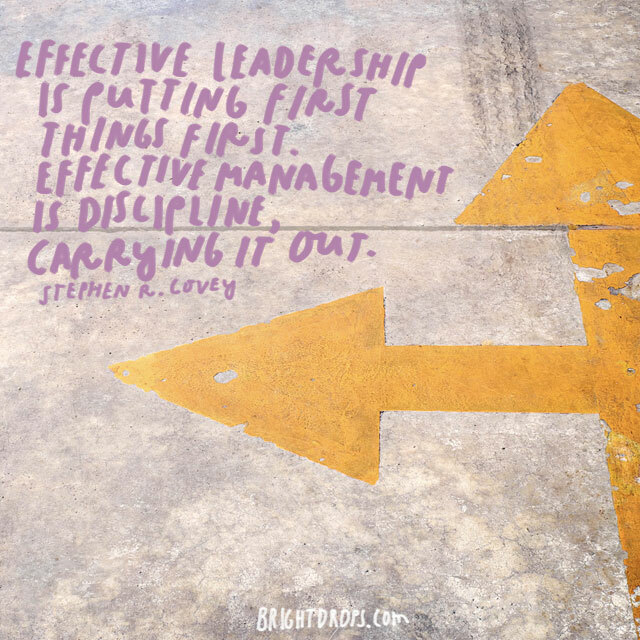 Stephen R. Covey on Effective Leadership. Leading is putting things in order. Then you have to have the skills to execute. You have to be able to delegate tasks to those who are best equipped to fulfill each aspect of a project. Leading sets everything up. 57. 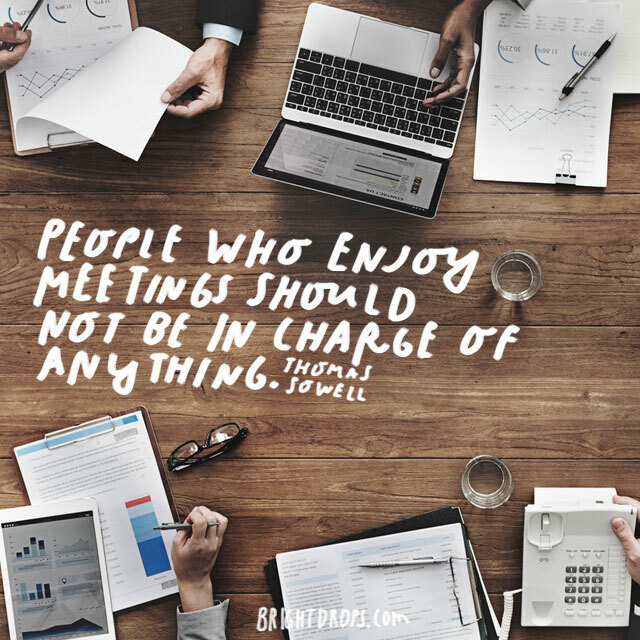 Thomas Sowell on Meetings. Don’t be that guy! Don’t be the leader that calls a meeting every day or several times a day. No one has time to sit in meetings. 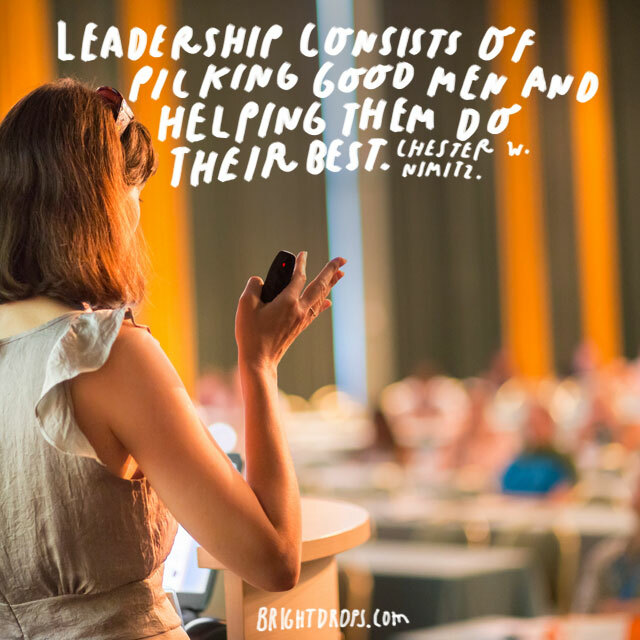 If you establish yourself as the meeter leader, you’ll never have the full respect or the best efforts of your team. 58. 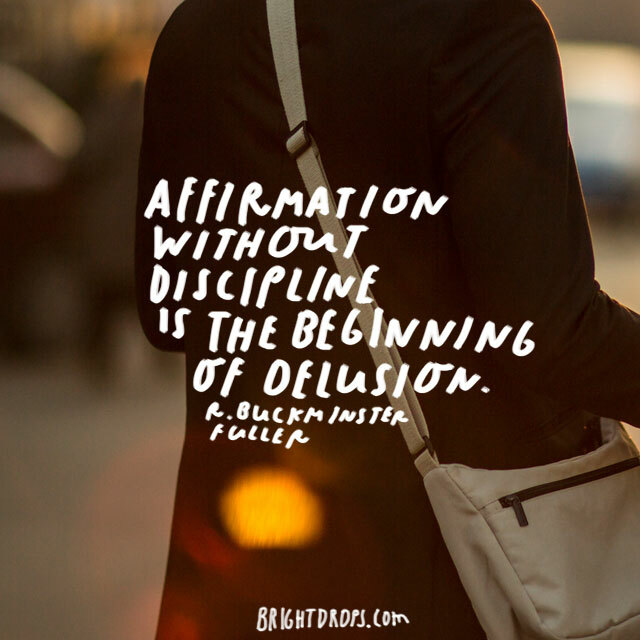 R. Buckminster Fuller on Affirmation. You’re doing a great job, but don’t get ahead of yourself. Make sure that you aren’t over praising your workers either. You have to make sure that they get a balance of “great job” as well as where they can grow even more. 59. 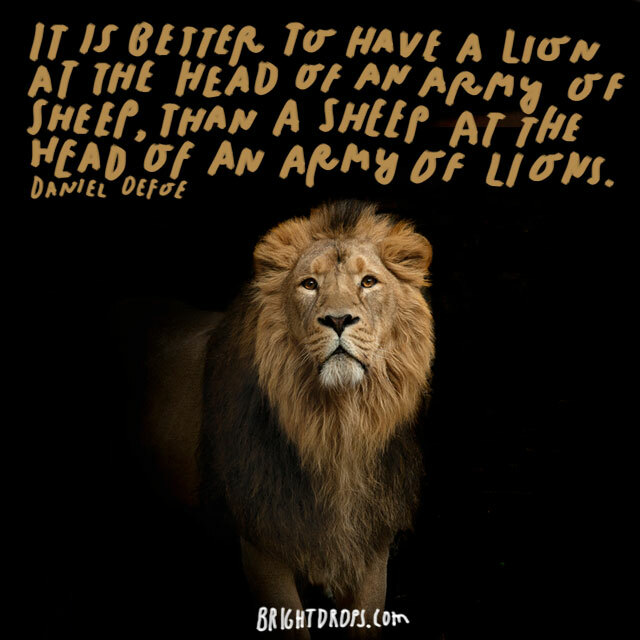 Daniel Defoe on Lions and Sheep. Alexander the Great said something very similar. The truth is that you cannot be a sheep and let everyone boss you around. If you are the leader, but the lion and surround yourself with lionesses. 60. Warren Bennis on Making Dreams Come True. 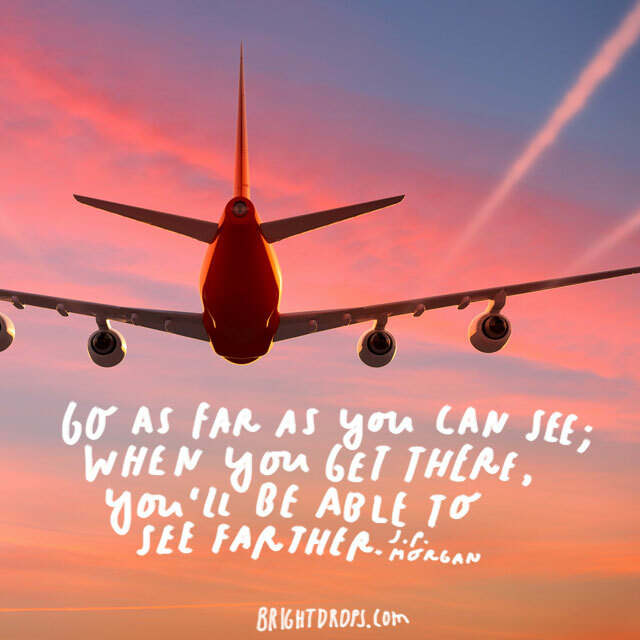 Seeing where you want to go is one of the keys to leadership. Use that key to unlock those dreams and make them reality. 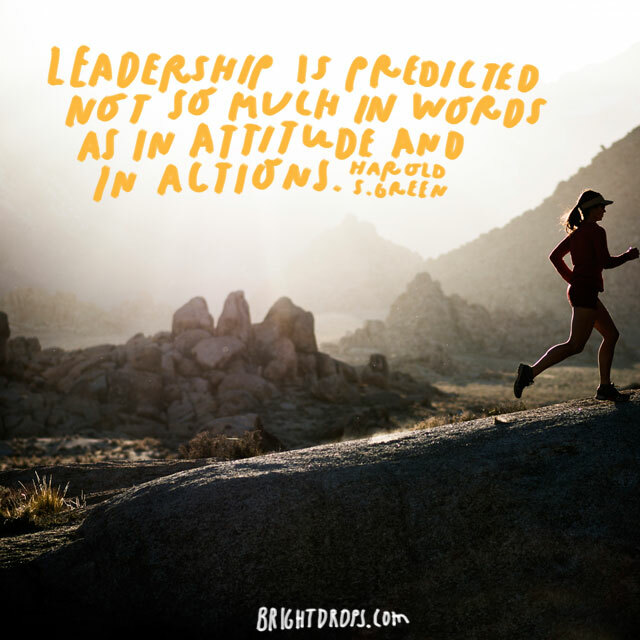 That translation is what can make you an effective leader in the eyes of those around you. 61. Harold S. Green on Leadership in Motion. Leadership is solely about walking the walk. 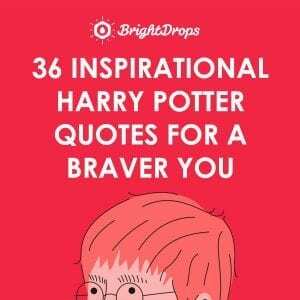 You can have all the inspiring words to fill volumes and even libraries, but if you don’t have the right attitude and the actions to back up all those words, they are meaningless. 62. Lao Tzu on Being the Chief. Everyone wants to have a leader. They need someone to look to for direction or guidance. No one wants to be lorded over having every moment of every day watched and micromanaged. 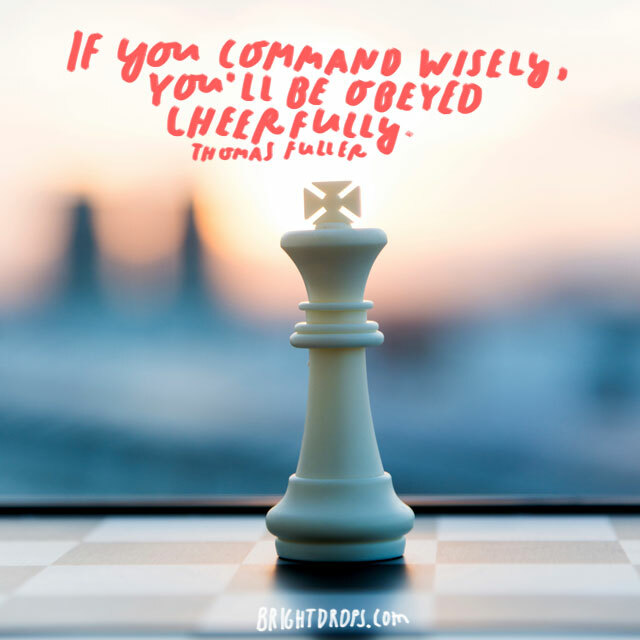 Find a way to be the head of your tribe, without being a tyrant. 63. 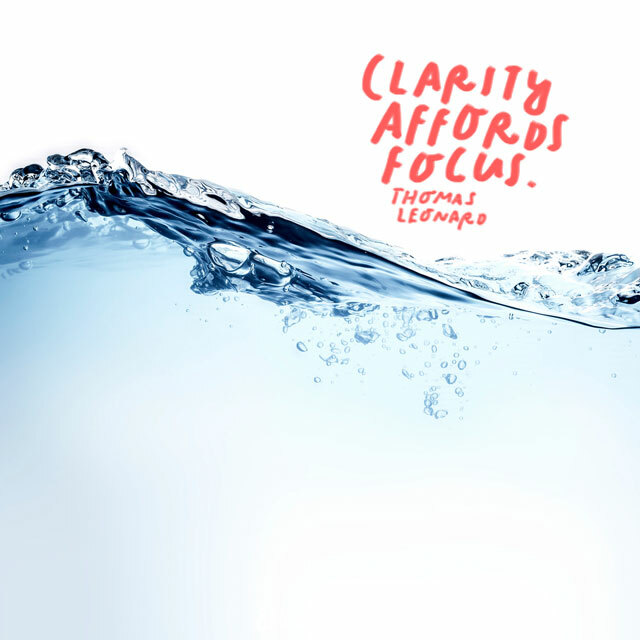 Thomas Leonard on Clarity. When you understand your role of leader, you will begin to have clarity of mind. When you embrace that clarity, you will be able to see your goals clearer. When you see the goals, you can suddenly see what needs to be adjusted to get their sooner. 64. Thomas Fuller on Being Obeyed. Choose your battles wisely. There is no need to continually stay on top of people. You don’t have to micromanage. 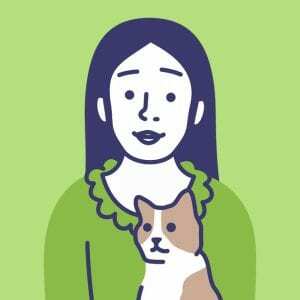 When you think you might be micromanaging, ask people if they feel like you’re too invasive or too demanding. They’ll let you know. Cheerfully. When you encounter problems, they are a way for you to grow. You can address those problems as a way to make an improvement. 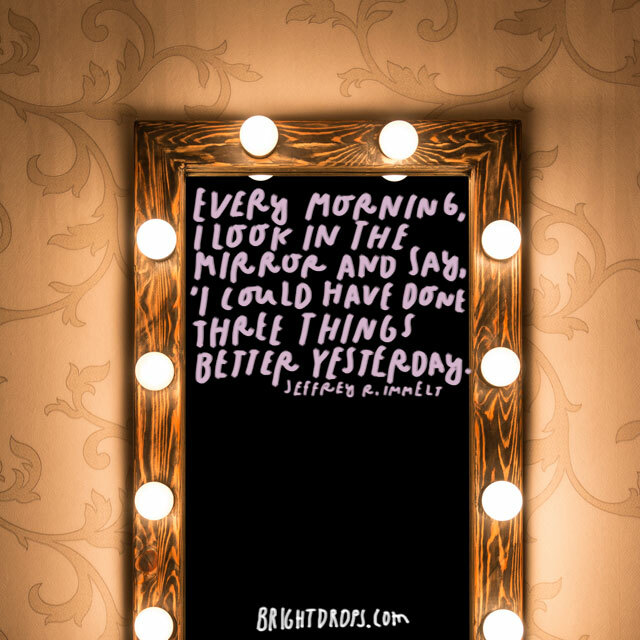 You can always do something better. Attack every problem as a way to show your leadership and it will be just that. 66. 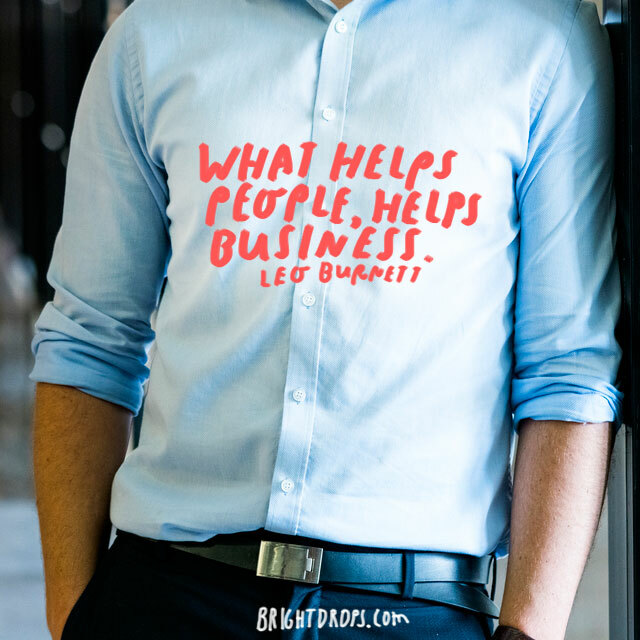 Leo Burnett on Helping People. Many of the problems you’ll encounter along the way are involving people. Perhaps they need a favor. Perhaps they made mistakes. The reality is that whatever you can do to help these people will help the business in the long run. Whether it helps morale or reputation, it is helping. 67. J. Paul Getty on Getting Just Desserts. No one is an island. The longer you lead, the more chances you have to rub people the wrong way. If you are always approaching problems with the people in mind and not the bottom line, then you will always come out on top. 68. 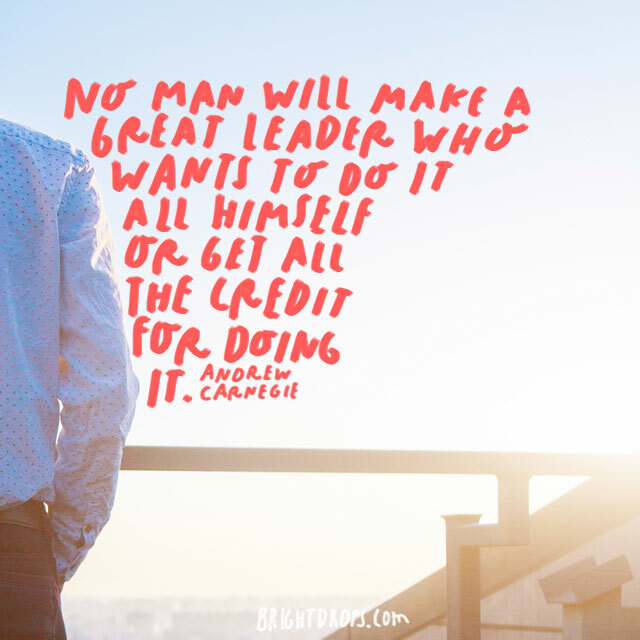 Carnegie on Getting the Credit. You can never do everything alone, even though there are times you think about it. Even more important than that, you can’t take credit for what others have done. How many times have you seen someone take the credit only for it to blow up in their face? 69. 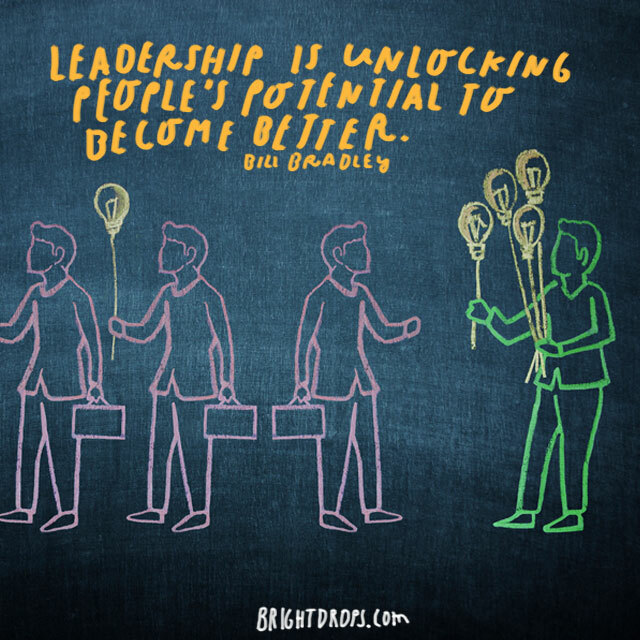 Bill Bradley on Unlocking Potential. Bill Bradley was the most successful US Men’s Soccer Coach ever. He won more cups and got farther in the World Cup than anyone else. If he was given the time he needed to unlock the full potential of the program, he would be a legendary leader. 70. 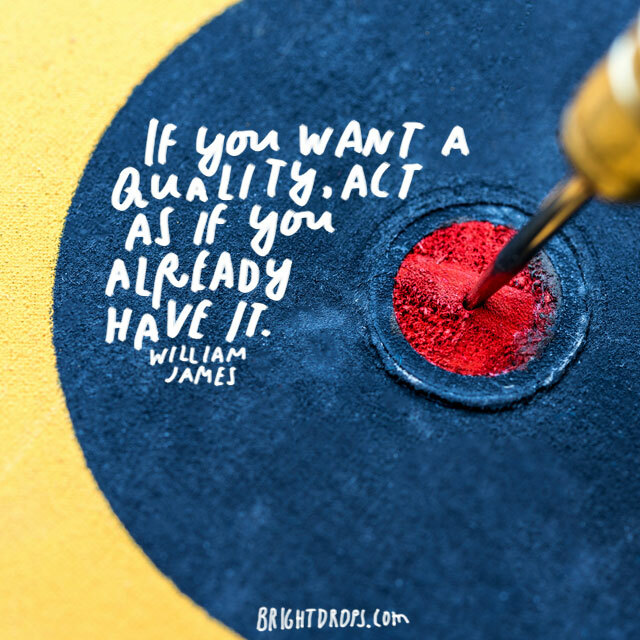 William James on Quality. If you feel that you should be more compassionate, then be more compassionate. 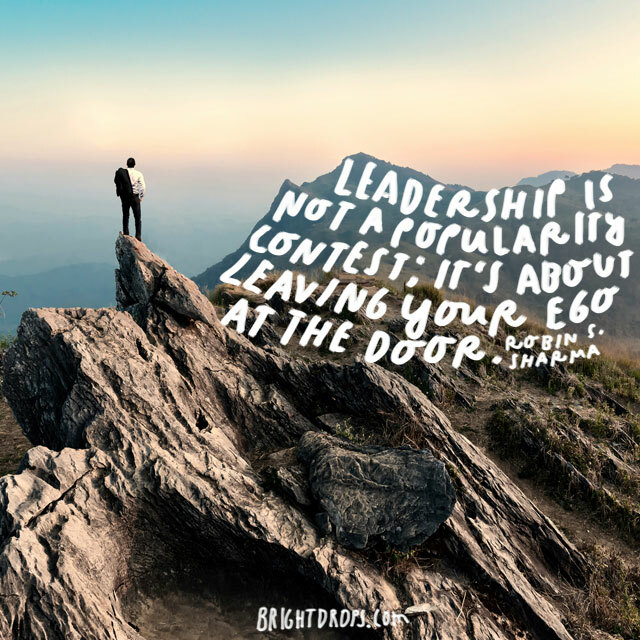 You don’t have to wish you could be a better leader or a better example, you just have to start displaying those qualities and then, voila, you have them. 71. Harold S. Green on Teaching and Learning. You can sit through an entire MBA lecture series from Harvard Business school. In fact, you can stream most of those lectures from your own desk nowadays. They can only teach you principles. You have to learn for yourself how to lead people. 72. 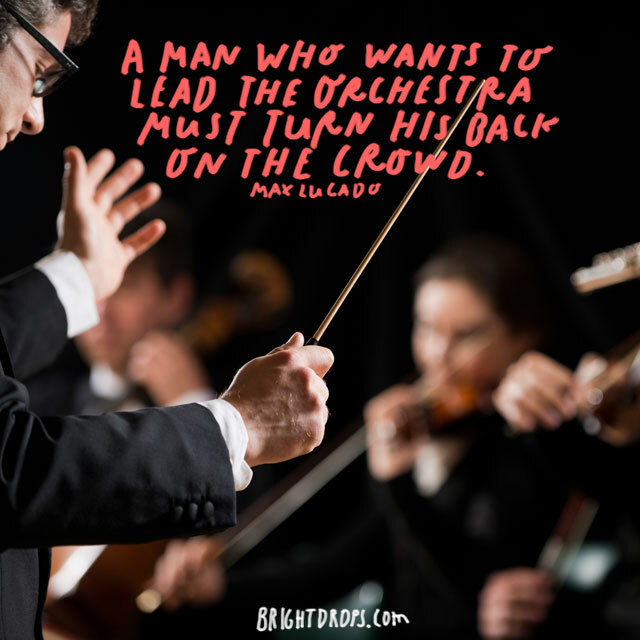 Max Lucado on Turning Your Back. The conductor of the most beautiful symphony does not face the crowd when he is working. In the same way, a leader must lead by going away from the crowd. 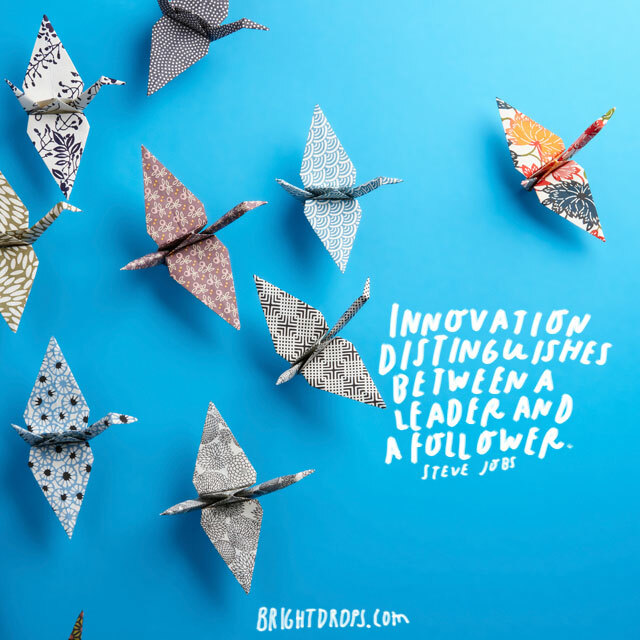 While everyone else is following the status quo, leaders look for better ways. 73. 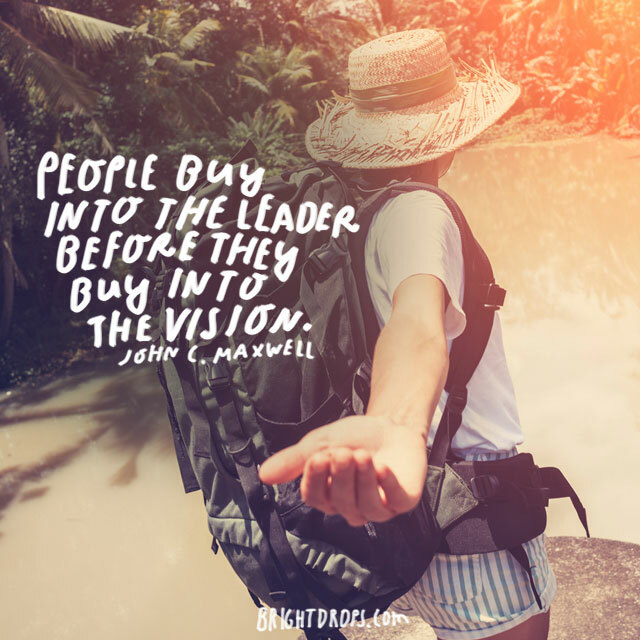 John C. Maxwell on Buying In. When you have the passion and the drive to be successful, it shows. People will magnetize to you before you even present the first idea. Chances are, if you are in a leadership position, then it was probably a very natural process. 74. Douglas William Jerrold Is Sharp. When you have the skill set, you know the skill set. You are looking for people just like you. You don’t want to have people that you have to motivate every day. You want people that can get on your team, because they want to lead a team of their own some day. 75. Ray Kroc on Being Good. Ray Kroc started McDonald’s at a time where there were no pre-cut fries or pre shaped patties. He had to hire people he knew could do every job. If you talk to someone who worked for McDonald’s in the first couple of decades, they were proud of their job and their work. 76. Ivan Illich on Being Right. Of course you’ll make mistakes. You have to lead with the right intentions. Even if you take the wrong way, you can recover later. If you have the right people, they will be with you every step of the way. Just don’t forget to apologize. 77. 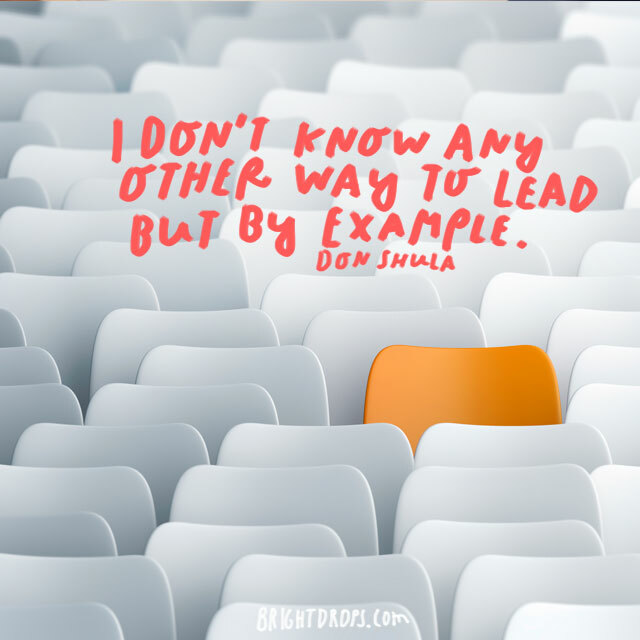 Don Shula on Leading by Example. The only way to lead is by example. Don Shula carried himself like a winner, a champion really. In his entire career, he only won 2 Super Bowls. He’s remembered as a true leader and an all around champion because he carried himself that way. 78. Henry Kissinger on Operating the Familiar. You should be an expert. But when you are a leader you do things the expert can’t do. You know what needs to be done, and you do even more. You change the way the game is played, and that’s what makes people happy to follow. 79. 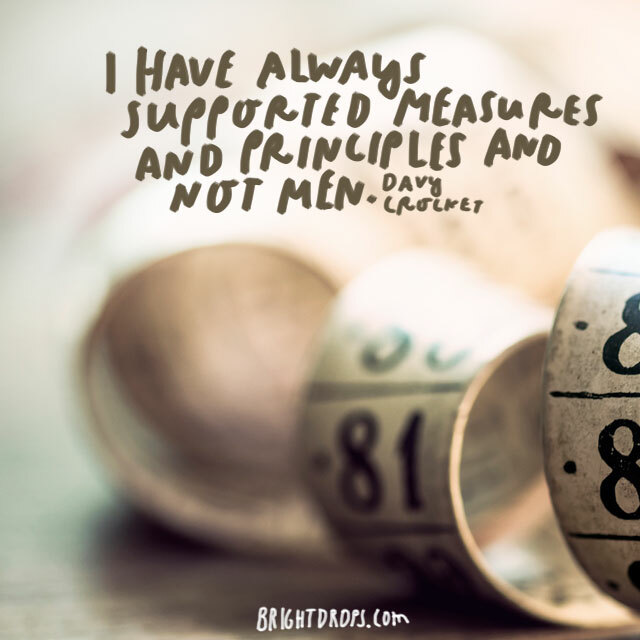 Davy Crockett on Supporting Principles. It’s terribly important to be a great person, but you also have to make the right decisions. 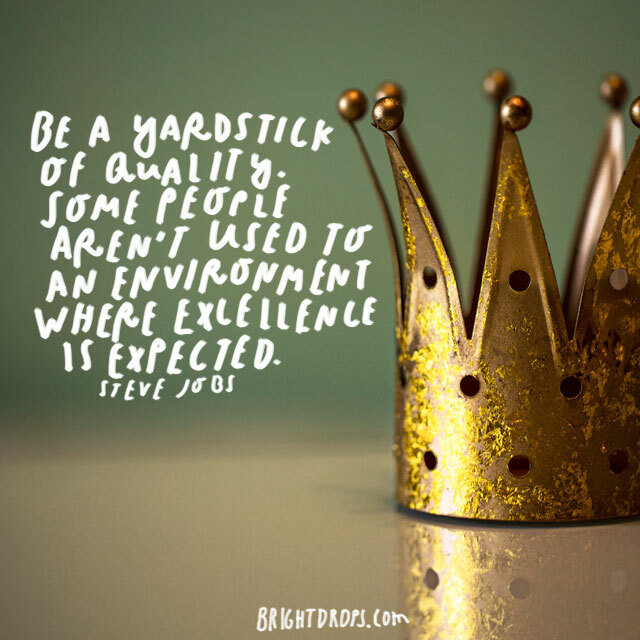 You have to have the standards of excellence. In the long run, people must know that you stand for consistent excellence. Charisma will win them over, but wisdom will keep them. Don’t think that you have to go with the industry standards to be your guidelines. You can go above and beyond what minimums have been set. You can choose to do the bare minimum, or you can choose to change the game altogether. 81. 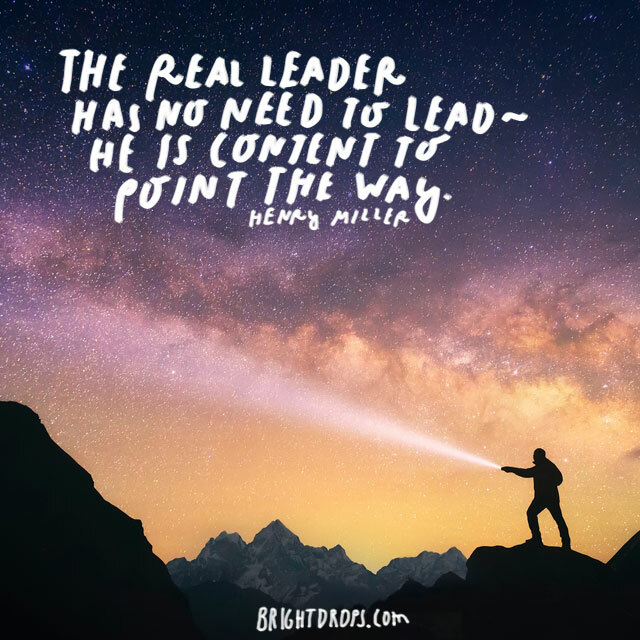 Henry Miller on the Real Leader. 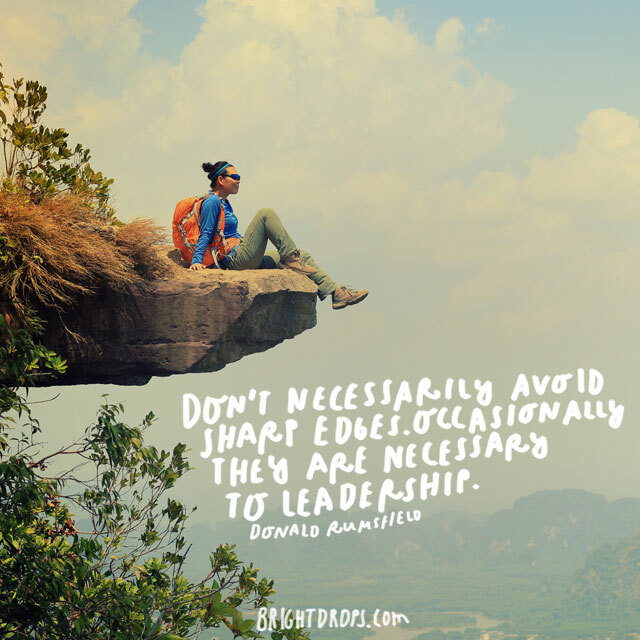 This leadership quote is really aimed at those who have spent time as a leader. When you are a veteran leader, you can point the way. You’ve already chosen your team of leaders. Each of those team members is trusted to pursue excellence in their own way. Just point. 82. An Wang Has Heart. You must love what you do and do what you love. That’s the only way to develop the passion and drive that makes you a strong and charismatic leader. People will want to follow you, it’s your job to keep them on your team. 83. 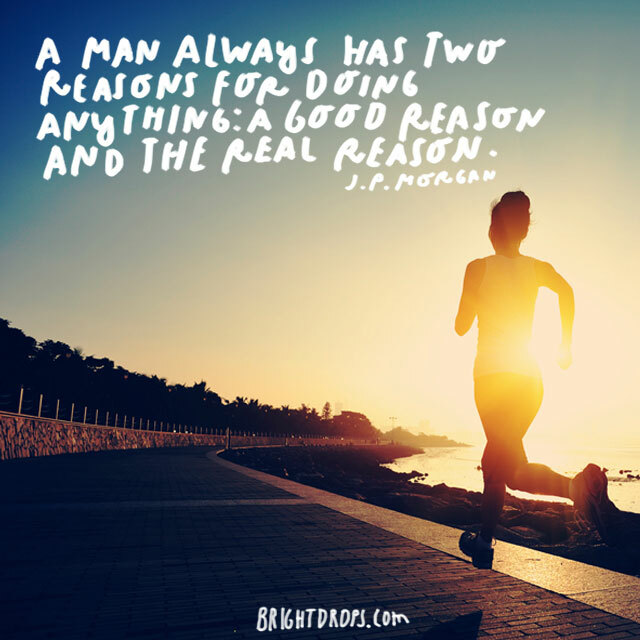 J. P. Morgan Has 2 Reasons. Any great leader knows that there is a great deal of sleight of hand in the leadership business. You have to be able to sell the idea to your people, but you also have to have a grasp on the real reason you are doing what you’re doing. 84. 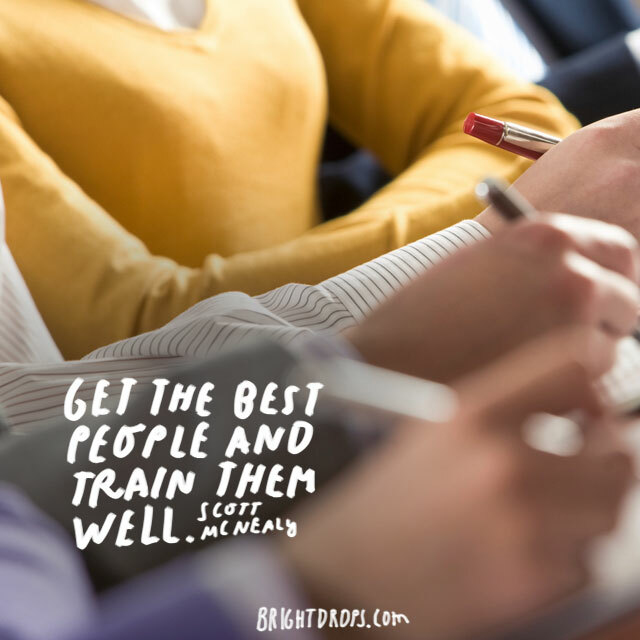 Scott McNealy on Getting the Best People. When you have the people in place, you also have to get them to the work. Unfortunately, you can’t just inspire greatness, sometimes you have to teach the nuts and bolts of how to do things. Especially if you’re a great leader, because you’ll have your own methods to teach. 85. 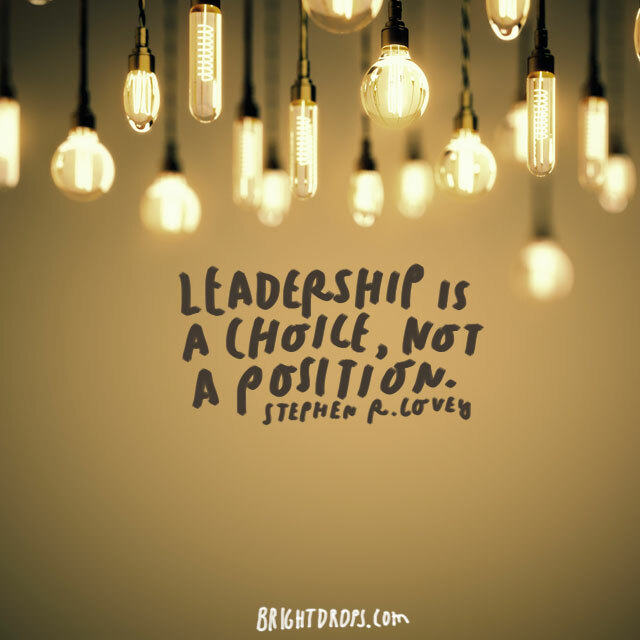 Stephen R. Covey on the Meaning of Leadership. You must choose to lead. If you’ve been given a title, it doesn’t make you a leader. Anyone can have the title of manager or president or anything else in the world. The fact is that leading people is a choice that must be made. 86. 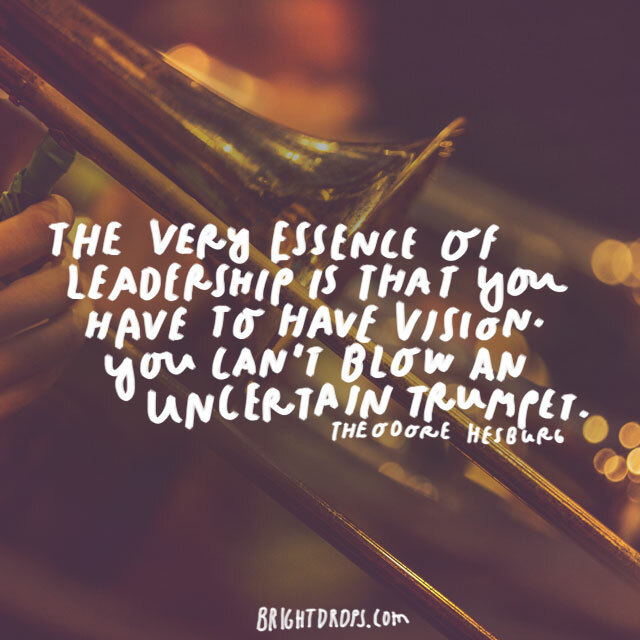 Theodore Hesburg on the Essense of Leadership. You have to be able to paint that picture in the mind. People must clearly see the end goal. They can’t just hope that you’re leading them in the right direction. You must believe with every fiber of your being that you can do things. 87. 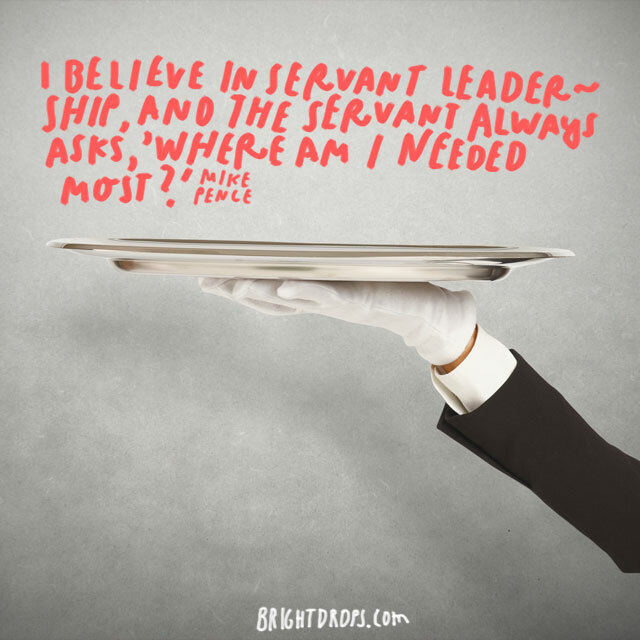 Mike Pence on Servant Leadership. There are times where you must be a servant to your team. You have to find the area that you are most needed. You have to plug every hole and make sure the machine runs like there’s nothing wrong. 88. 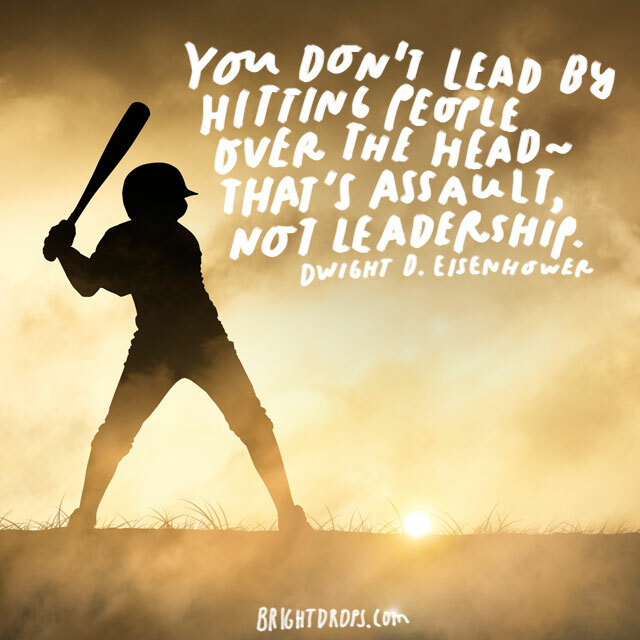 Ike Eisenhower on Hitting People Over the Head. You can’t lead by force. There’s no leadership quote out there that will promote tyranny or fear as great motivational tools. You have to lead people, not invoke fear in them. They must respect you, but not fear you. 89. 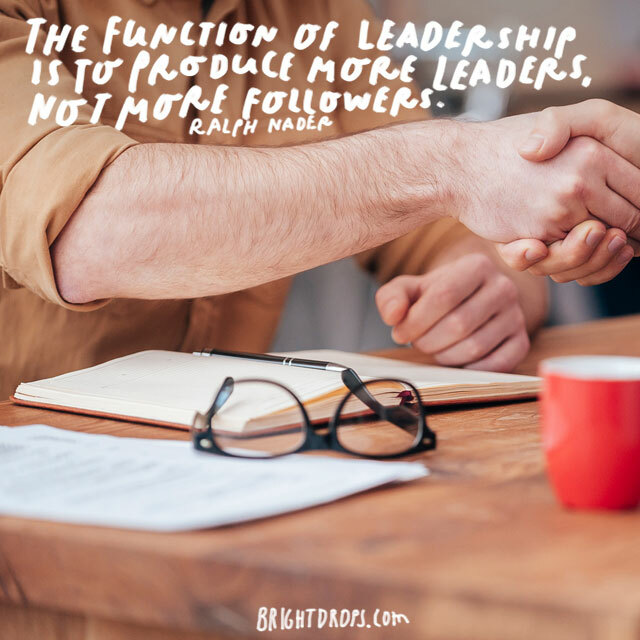 Ralph Nader on the Function of Leadership. Ralph Nader knows that the only way to have the best team, is to have people that want to lead their own team. You have to hope that they have the same motivation to succeed that you have in you. Their passion should be as strong as yours. 90. Carlos Ghosn on the Role of Leadership. This quote nearly sums up the entire job of the leader. You must take something that is huge, like the theory of general relativity. Then you have to break it into small chunks that can be accomplished. Then you have to match that with the personnel. 91. Yousef Munayyer on Humility. You must be humble. Even when you are the king of your domain, you have to keep the mentality that you are the same as everyone around you. When people sense that you feel superior, they will put you in your place quickly. 92. 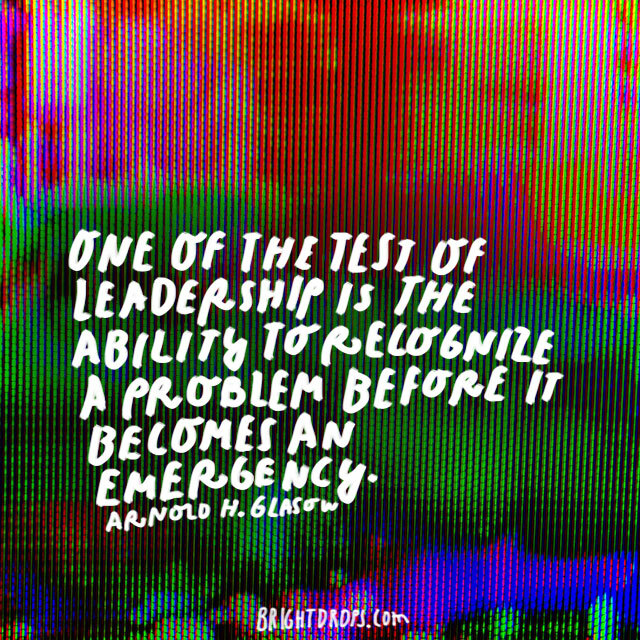 Arnold H. Glasow on Tests and Problems. 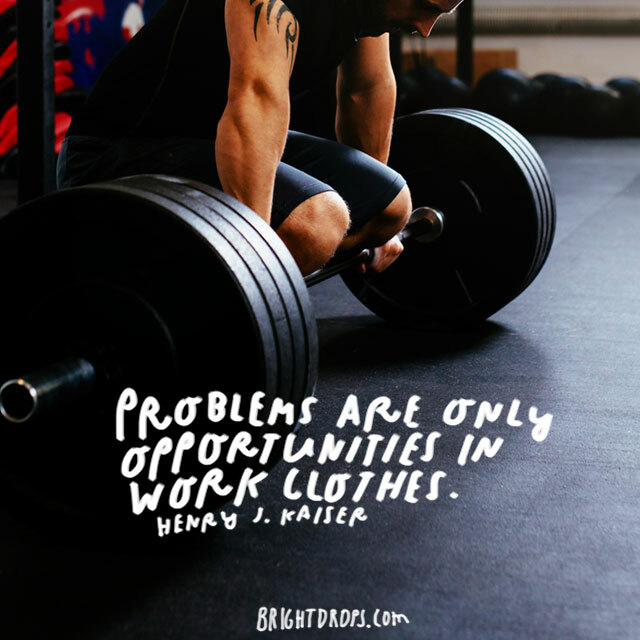 Problems arise and you have to identify them. If you are good at it, you will catch them while they are bumps in the road and not sinkholes that can tear the fibers of the spacetime continuum. 93. 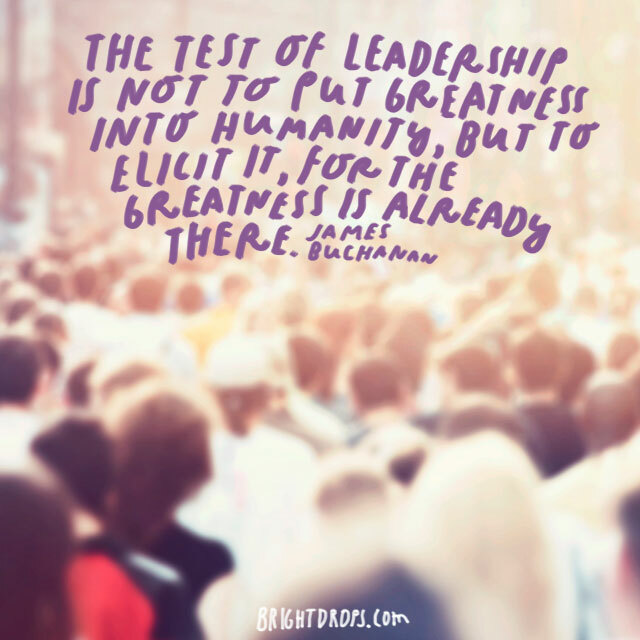 James Buchanan on the Test of Leadership. People have greatness within them. You have to unlock that potential in everyone. Anyone can manage and get things done. To get the best results, you have to make people be at their personal best. 94. Robin S. Sharma on Popularity. Of course you want people to like you. However, you can’t hang your hat on getting people to like you. On those days you have to deliver bad news, you really don’t want to let down friends or fans. You have to leave your ego out of it. 95. 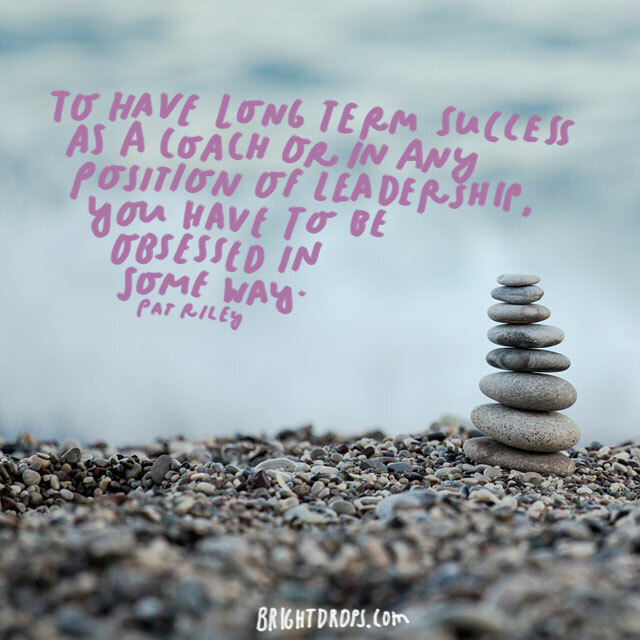 Pat Riley on Long Term Success. Obsessions are bad, if you are talking about the sort of thing that gets you featured on a crime documentary. If you are obsessed with success and fulfilling your dreams, then you had better be an obsessed fool. 96. Tom Landry on Instilling Confidence. When you are in a trying time, you must exude confidence. 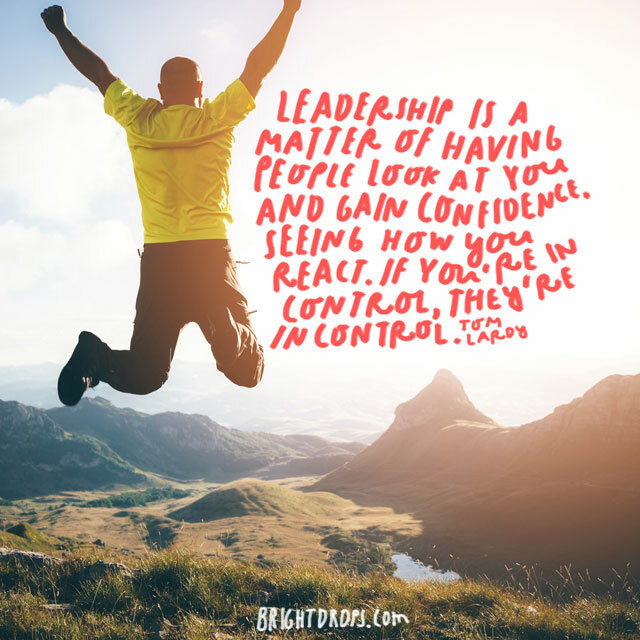 Your team will gain confidence. If you come across as someone who is in control, they will find some sense of control for themselves. Everyone remain calm. 97. Donald Rumsfield on Sharp Edges. Things don’t always run smoothly. You can’t always be smooth in every delivery and interaction either. 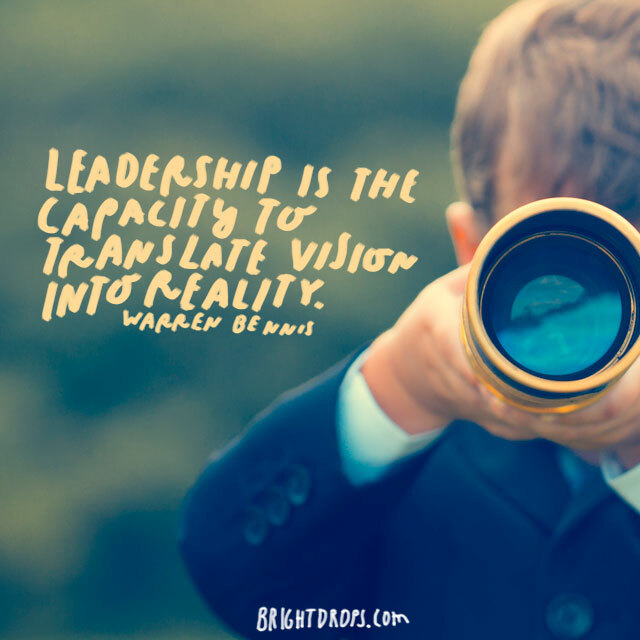 Being a leader is about doing what’s right for the big picture. You can’t worry too much about the small losses, you have to focus on the big victory. 98. Jeffrey Immelt on the Intense Journey. 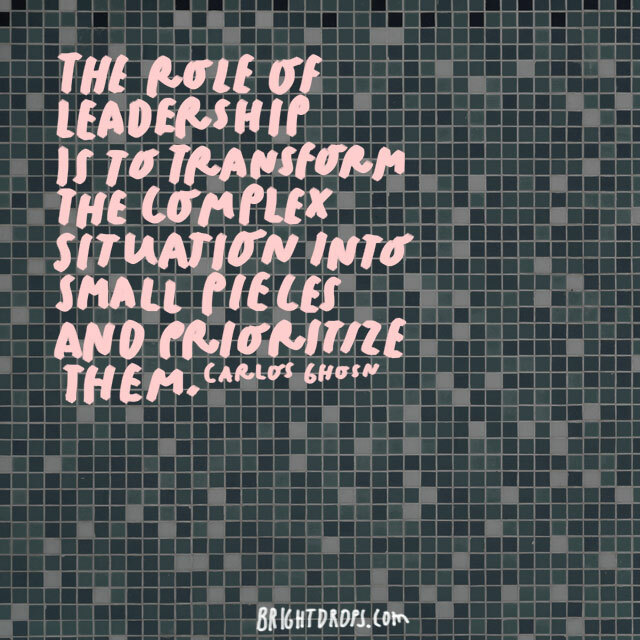 The first in a duo from Mr. Chicago himself, this leadership quote focuses on that big picture process. You have to know that you can trust yourself. Along the way you’ll discover things about yourself that you might not have known before. 99. Jeffrey Immelt on Your Reflection. The next natural step in the process is finding the things you can do better. That’s part of the ongoing journey of leadership. You must find the areas where you can grow and be better. That’s the toughest part of being a leader: Always giving your complete and total effort to grow and improve. 100. 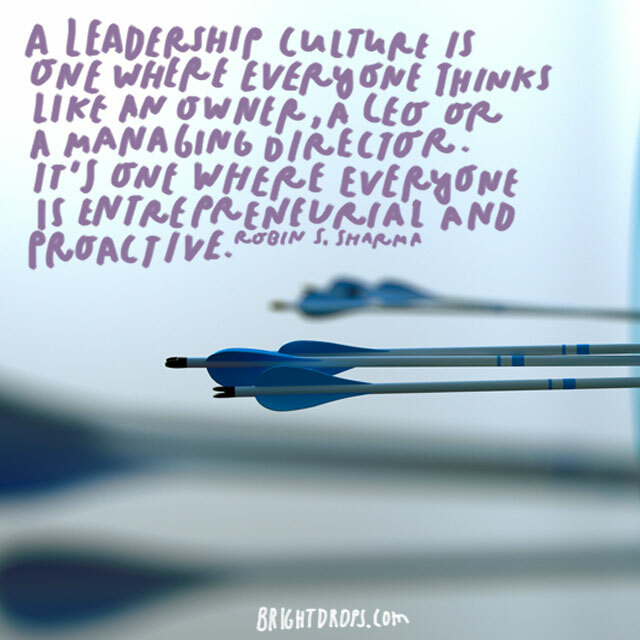 Robin S. Sharma on Leadership Culture. 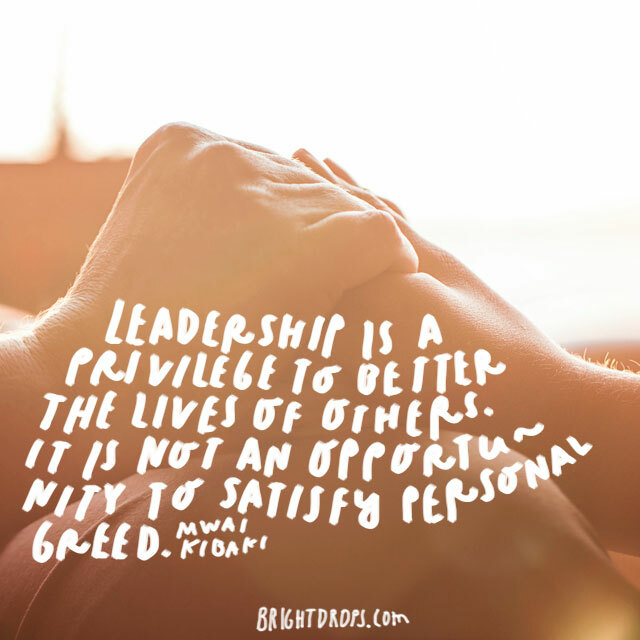 All the traits of this leadership mindset must fill you and those around you. When you can create that type of culture, you never have to stress about the next project or the next paycheck. Everyone is constantly working to improve and grow. And they will. 101. 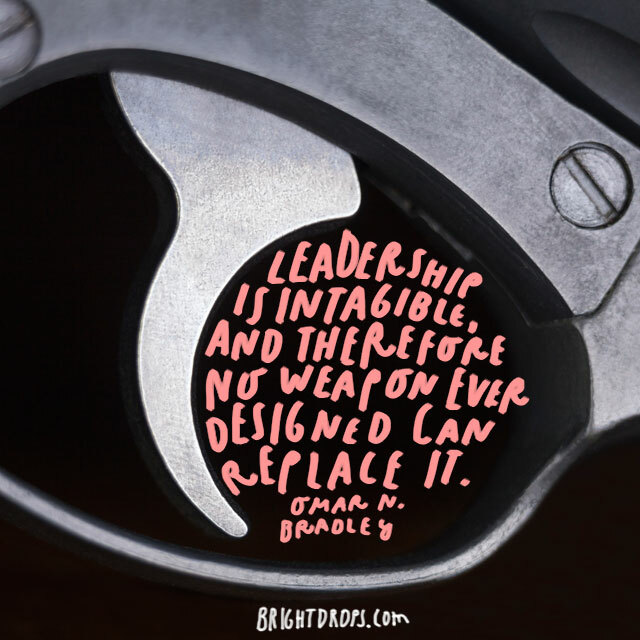 Omar N. Bradley on Invincibility. No matter how many robot armies we have, someone will have to lead them. If you can instill these valuable principles in yourself and those around you, you will become irreplaceable to the world. People will seek you out just to get your opinion or your approval. 102. Bill Owens Takes an Active Role. You must take an active role. There are no days off for a leader. You’ve got a lot of long hours ahead of you. However, you must know that you can’t do it all on your own. You have to instill that same drive in your team. Then, you have to trust them to bring that vision into reality. 103. Mwai Kibaki on the Privilege of Leadership. You must always think about the privileged position you have been given. 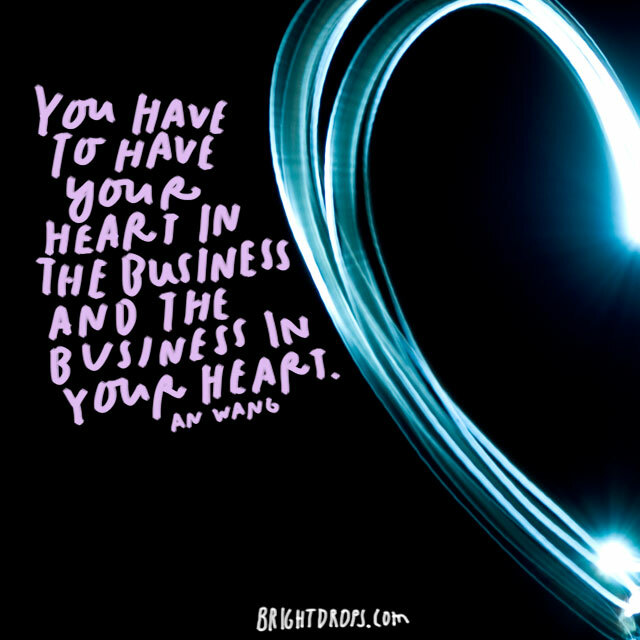 Whether you’re the head of your own business, or someone has appointed you. Those people that answer to you, they have entrusted you with that high office in their personal and professional lives. You must consider all the little roles you fulfill for those people. 104. 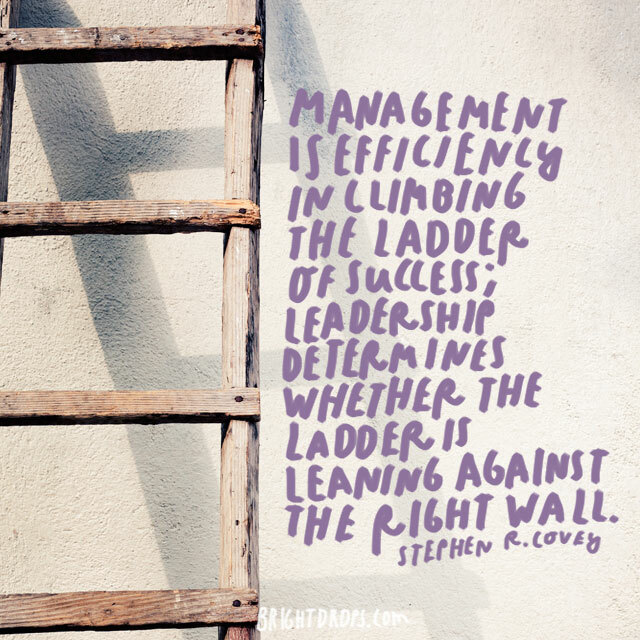 Stephen R. Covey on Climbing the Ladder. You must be able to climb efficiently of course. But before anyone can begin climbing at all, you have to make sure you have the right ladder, it’s on stable ground, and that the ladder is necessary at all. Don’t just go where you’re told. 105. Tom Landry on Getting People to Achieve. You have a lot of people that answer to you. You are a lot of things to those people. You’re more than just a boss or a teammate. You’re probably the person they have to call to say they need a day off. Can you stand being the person that makes someone fake being sick? 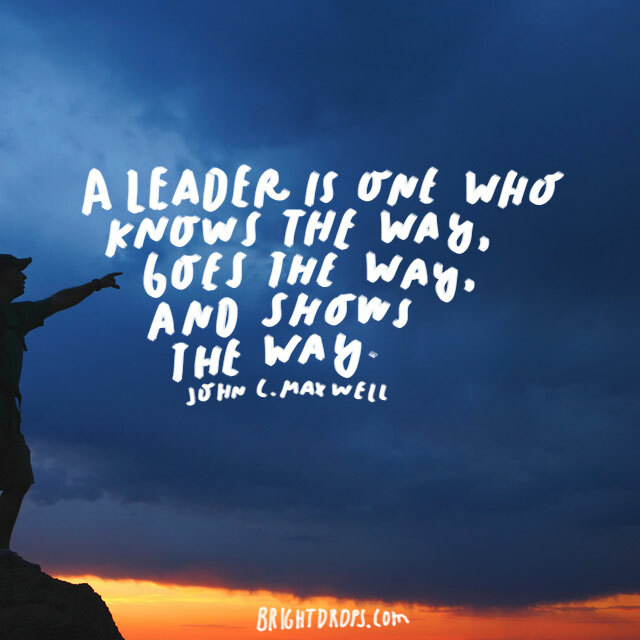 Hopefully, you are leading people in a way that makes them love you, and love what they do. 106. 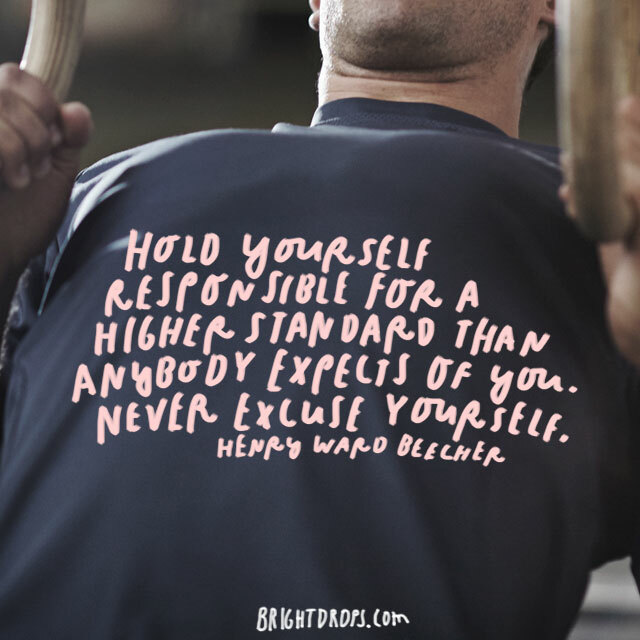 Henry Ward Beecher on Higher Standards. Probably the most important thing in leadership is fulfilling your own goals. Never settle for what others expect of you. They will always tell you that you can’t do something or that you are shooting for the stars. Never let that discourage you. 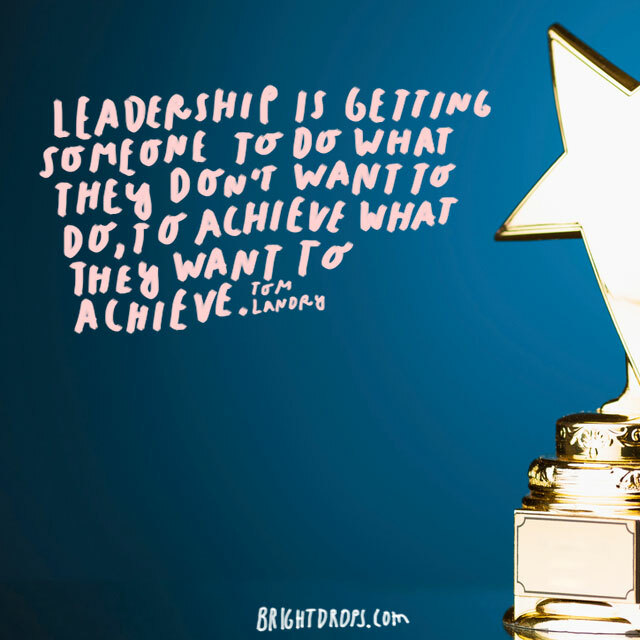 What is a good leader if you aren’t ambitious in the first place?